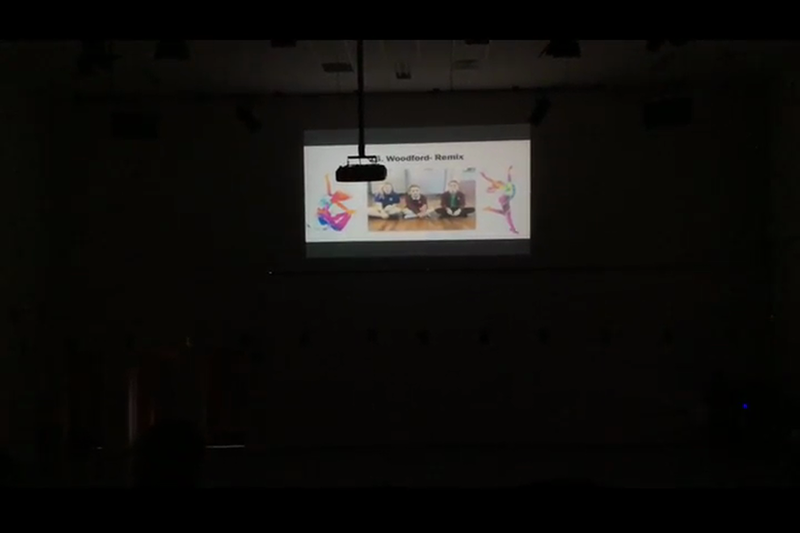 On Wednesday, some children in Year 5 and 6 attended the first ever PSSP Dance Festival at Sir John Hunt Community College. 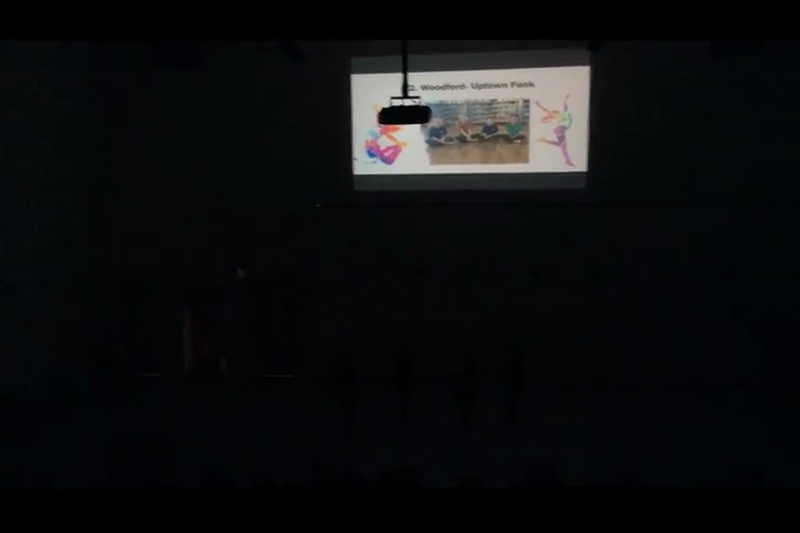 Over the last few weeks, they have been practising their dance routines with Hayley Jarvis, from the PSSP, and were given the chance to perform them in front of the other schools taking part at the festival. 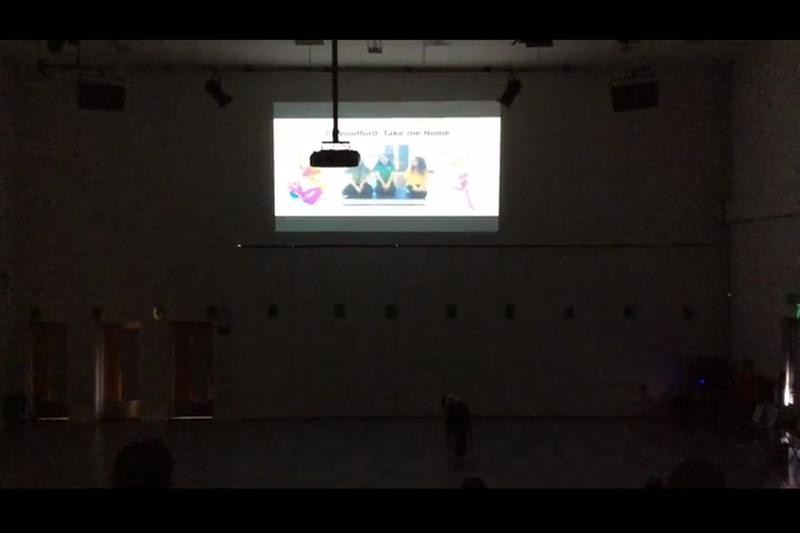 Well done to Roma B, Ruby S, Chloe P, Sophie W, Jodie K, Louise B, Elizabeth D, Melissa L and Connie N.
Check out videos of their fantastic performances below. 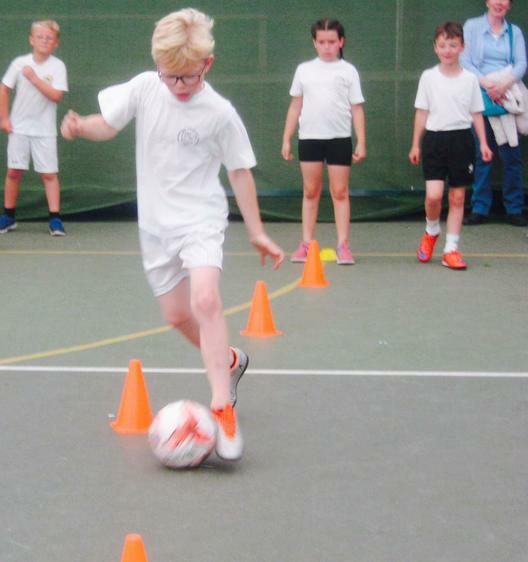 On Monday, a Year 3/4 football team took part in the Schools’ Cluster League at the Manadon Sports Hub. 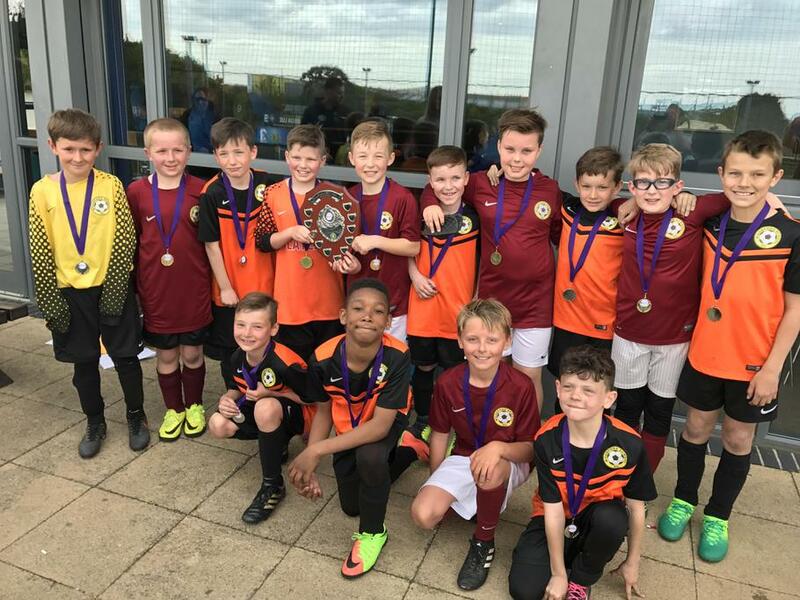 Considering this was the first time most of them had played together, they played some excellent football and it was great to see some of the younger children at Woodford get the chance to pit their wits against other schools. After undeservedly losing the first game 2-1 to Hooe, the team won their second match 2-1 against Pomphlett, before drawing their final game 1-1 against Boringdon. They finished runners up overall on the day, which means that they have qualified for the finals event in a few weeks time. Well done to Lucas S, Charlie B, Caelen B, Archie C, Callum L, Marley G, Jay B and Charlie B. This week, both the boy and girls' football teams came up against Montpelier in the knock out cup. The boys' match, which was a quarter final, ended 1-1 after a tense game played in difficult conditions. The match went to penalties, which Montpelier won 4-3. Meanwhile, the girls managed to win their game, which was a semi-final, 3-1 thanks to a brace from Ashleigh and a well-taken goal from Maisie. It was a super result against a good Montpelier team and the girls can now look forward to the final against either Horrabridge or Widey Court. 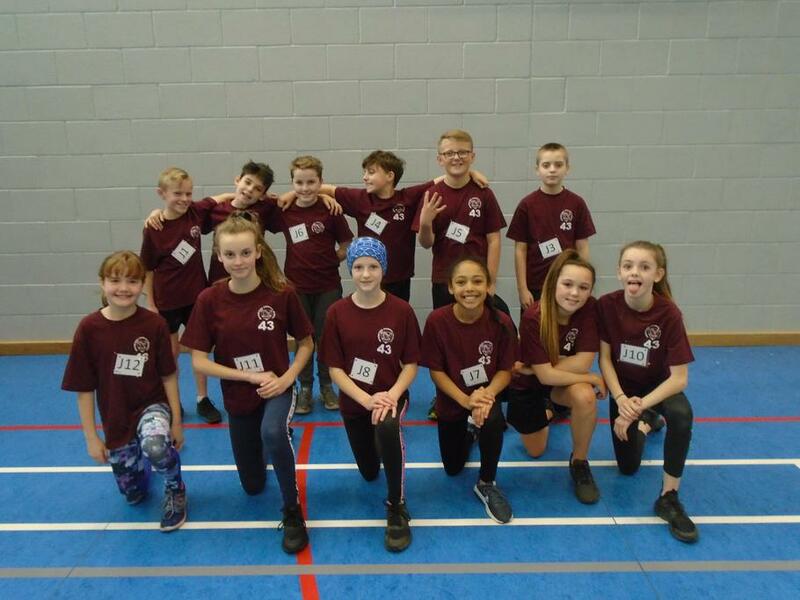 This week, our year 5/6 Indoor Athletics team went to Marjons to compete in the Indoor Athletics Finals, having qualified from the Plympton qualifiers at Hele's in November. 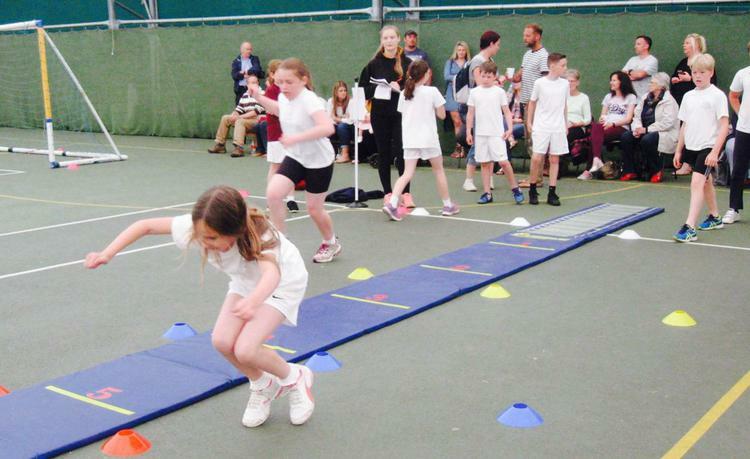 The children took part in 12 different track and field events, competing brilliantly against the other qualifiers. After a tough afternoon of competition, we secured a top 4 finish, qualifying to represent Plymouth in the Devon finals in March. 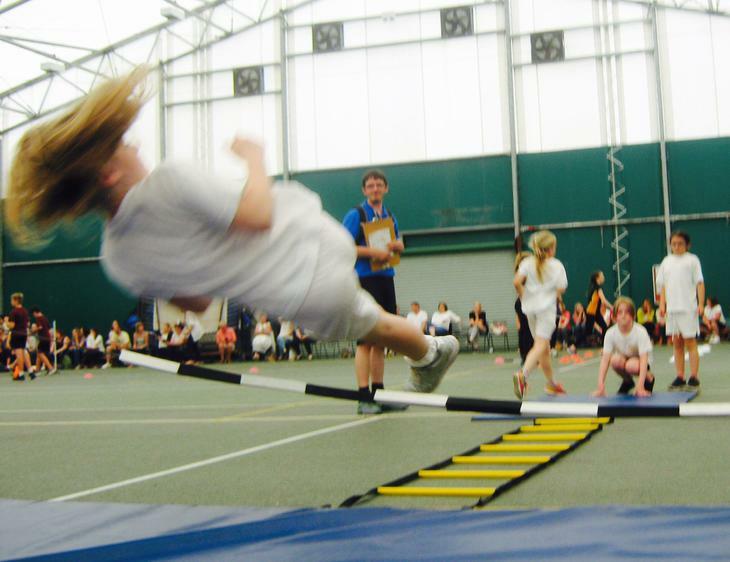 A huge well done to all the children who ran, jumped and threw with everything they had! 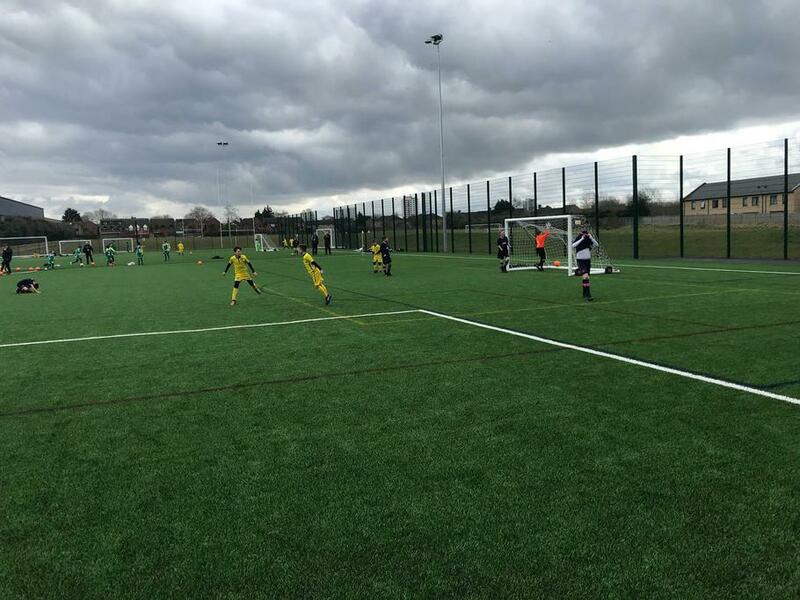 On Monday, the Year 5/6 football team took part in the Schools’ Cluster League at the brand new Manadon Sports Hub. 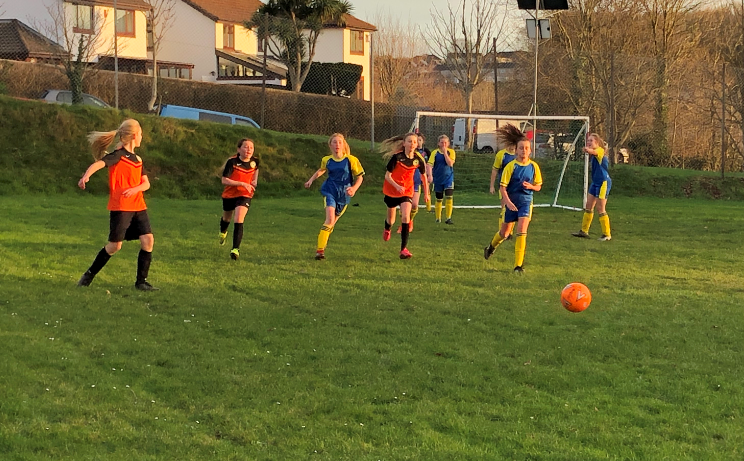 After a tight 0-0 draw against Boringdon, we played Hooe Primary, where we had to better Boringdon’s 2-0 victory against Hooe in order to win the group and qualify for the upcoming Finals event. The team really turned on the style against Hooe, winning the game 4-0 thanks to a superb hat-trick from Gabe and a well-worked goal from George. They can now look forward to the Finals event at the end of February. 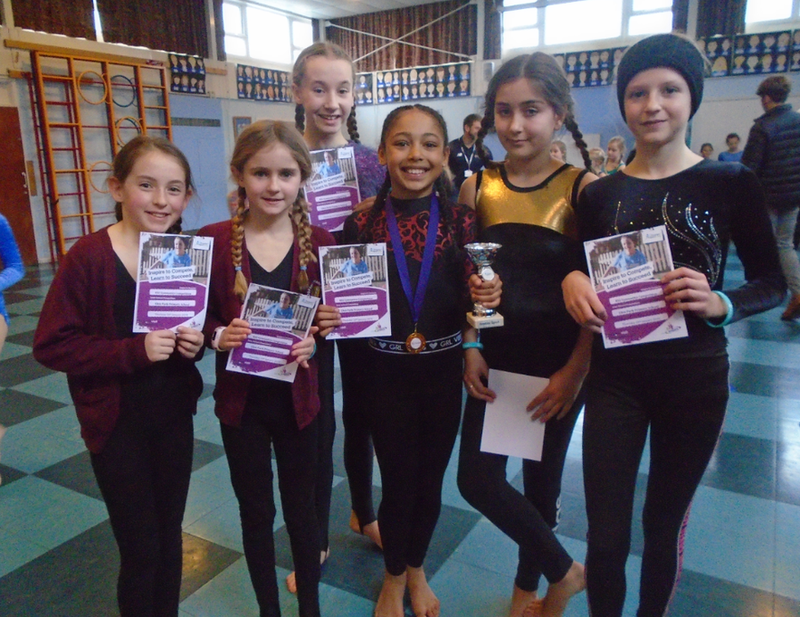 Well done to Ollie E, Harry E, Ashleigh G-L, Eddy B, Jack R, George D, Gabe R.
On Thursday, a group of Year 5 and 6 girls took part in the Premier Sports Gymnastics competition at Glen Park. 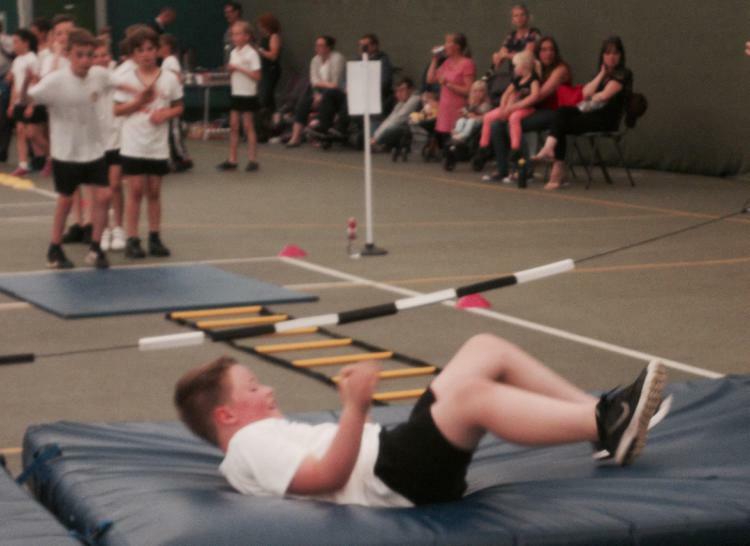 There were 3 other Plympton schools taking part, including Boringdon, Chaddlewood and Glen Park. 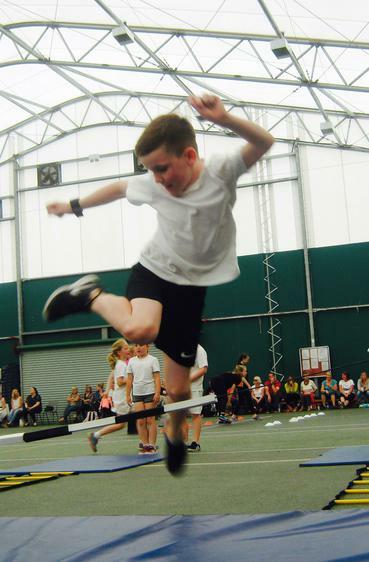 Each child performed an individual routine before each school did their group routines. 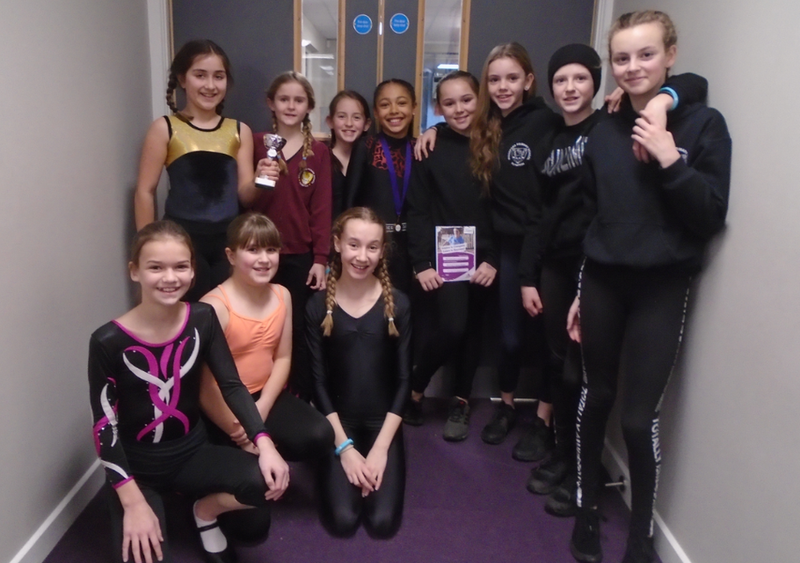 Well done to the Woodford team, who won the overall trophy for best group performance, and Sienna T who was runner-up in the individual performances. 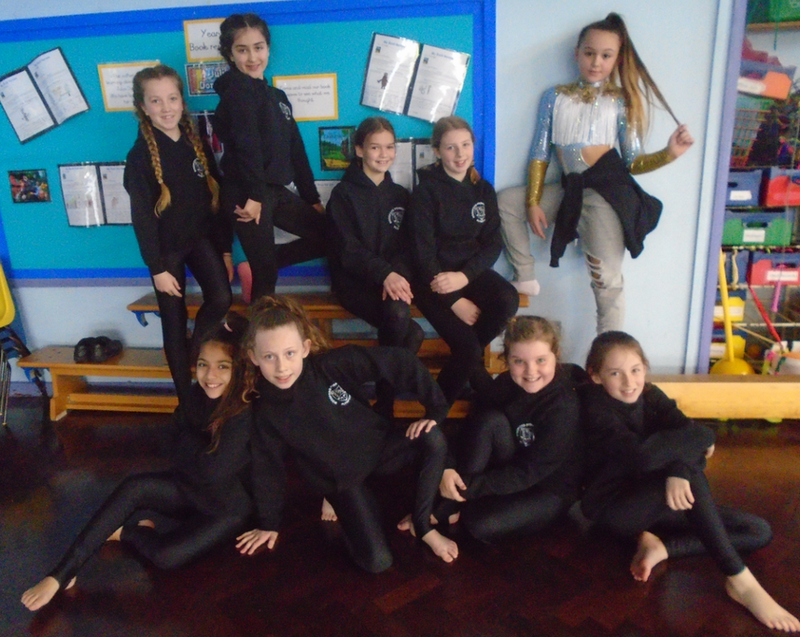 There were some incredible acrobatics on display, and all the girls were great ambassadors, representing the school superbly. 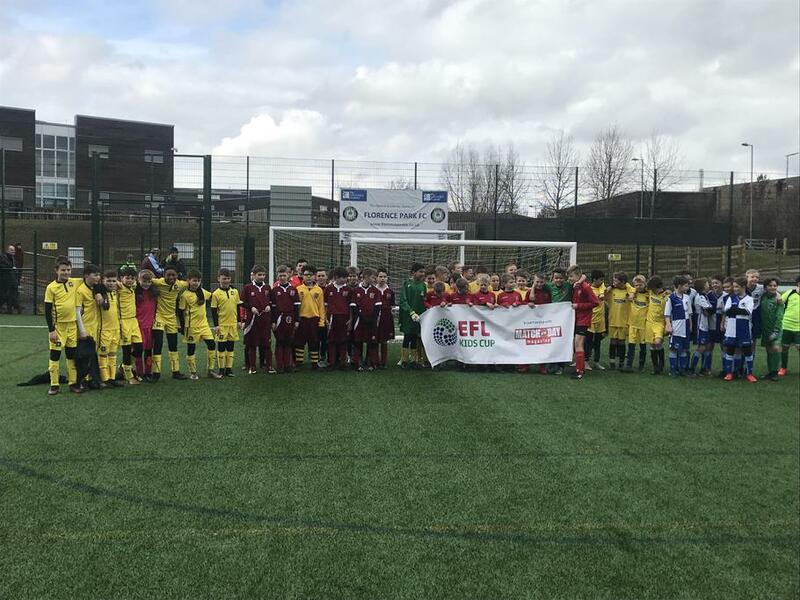 Well done to all who took part: Chloe P, Rosie W, Harriet M, Ruby S, Evie F, Connie N, Sienna T, Jodie K, Miah R, Jodie B and Victoria L.
On Monday, two Year 5/6 football teams took part in the annual EFL Kids Cup at Goals. It was an enjoyable afternoon of football, competing against most of the other Primary schools in Plymouth. Unfortunately, neither team made it through to the knock out stages but it was good experience, particularly for the Year 5’s, who were competing against predominantly Year 6 children. Well done to Ollie E, Harry E, Ashleigh G-L, Eddy B, Jack R, George D, Gabe R, Ethan H, Luke R, Sammy C, Max J, Cohen M and Spencer B. Well done to Woodford, who beat Glen Park in the Quarter finals of the Girls’ Knock out cup. They played superbly, winning the match 10-1 with nearly the whole team getting on the scoresheet. They can now look forward to a semi-final match soon. 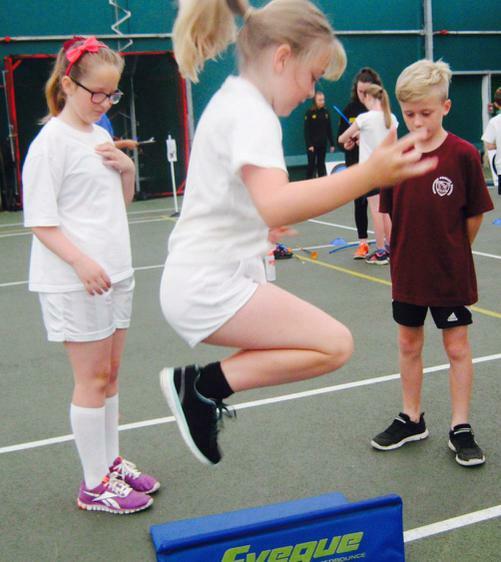 On Thursday this week, 11 children from Year 3 and 4 went to the Alternative Sports Festival at Chaddlewood Primary School, which was run by one of our sports partners, Premier Sports. 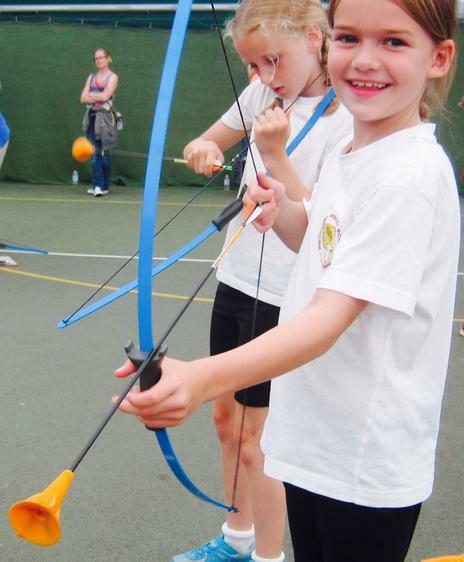 The children were able to enjoy a whole range of sports they may not have previously tried: Archery, Tri Golf, Badminton, Boccia, Fencing and Curling. 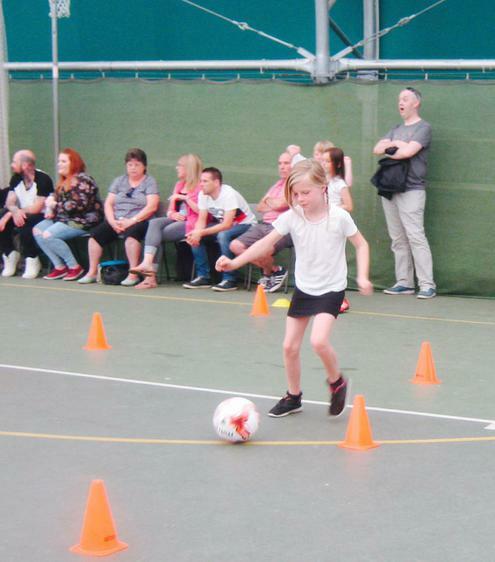 All the children were determined to give everything a go and developed some new skills along the way, whilst having loads of fun! The children represented themselves and the school in an exemplary manner so well done to all of you. 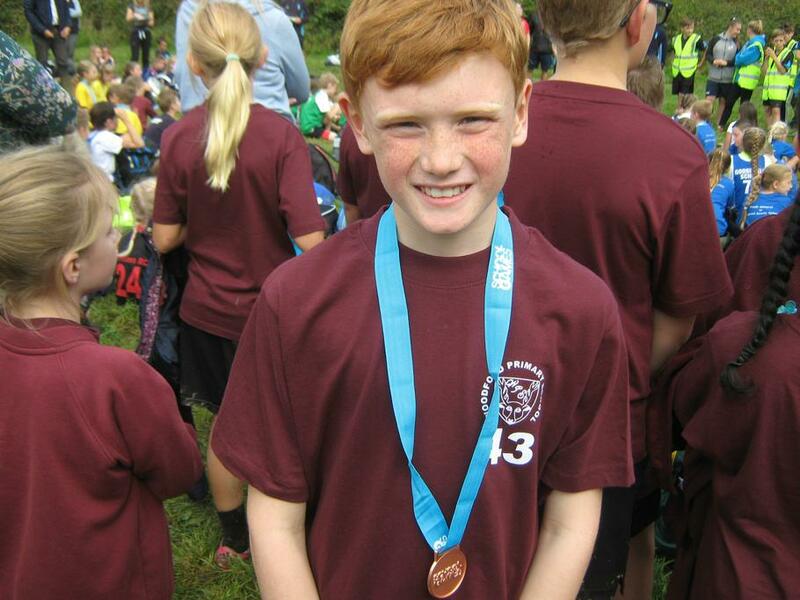 An individual mention must go to James Sowden in Year 4, who picked up a special award that recognised his sportsmanship, patience and encouragement of others throughout the event. 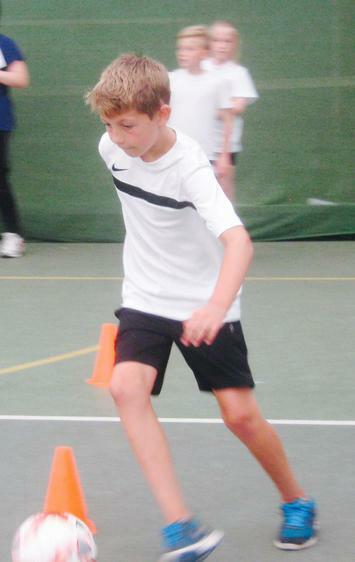 On Monday, a Year 5/6 football team took part in the qualifying stage of the annual Bettinson Cup. We were drawn in a tough group, alongside Montpelier, Widey Court, Oreston and Prince Rock. Overall, we won two and lost two, narrowly missing out on qualifying for the finals event in January. It was a great experience for the team - they grew in confidence with each game and by the end, were playing some superb football and scoring some brilliant team goals. 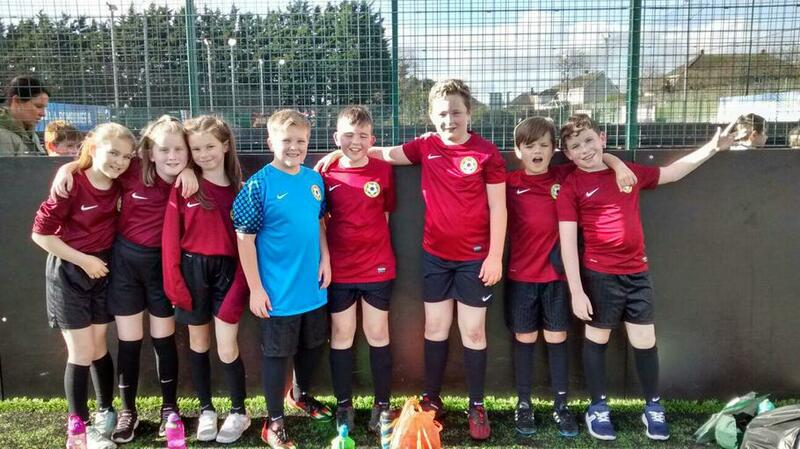 Well done to Ollie E, Harry E, Ashleigh G-L, Eddy B, Jack R, George D and Gabe R.
On Thursday, our Year 5/6 Girls' football team played Shakespeare Primary School in the Schools' Knock out cup. They played superbly in what were biting cold conditions, winning the match 4-2 thanks to four goals from Ashleigh! The girls can now look forward to a quarter final match against either Chaddlewood or Glen Park. 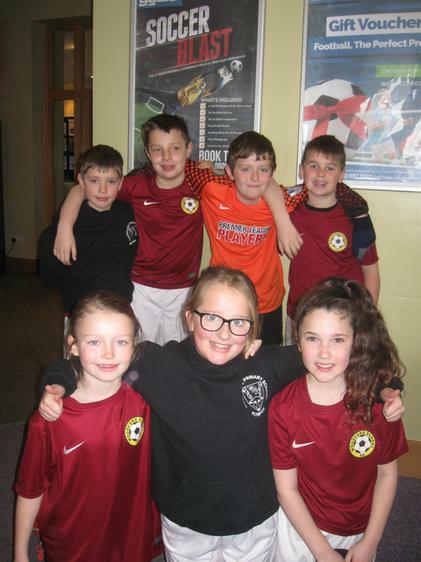 Well done to Maisie F, Miah R, Kayleigh P, Chloe W, Ashleigh G-L, Coral F, Victoria L and Jodie K.
On Tuesday, some boys and girls from Years 5 and 6 went to the Indoor Sport Hub in Paignton to represent Plymouth in the regional finals of Premier League Primary Stars futsal tournament. Some great football was played by all, in what were fast-paced games of non-stop action. It was a great learning experience, coming up against some of the best schools from Exeter and Torquay, and one that they can draw from in the upcoming Bettinson Cup tournament. 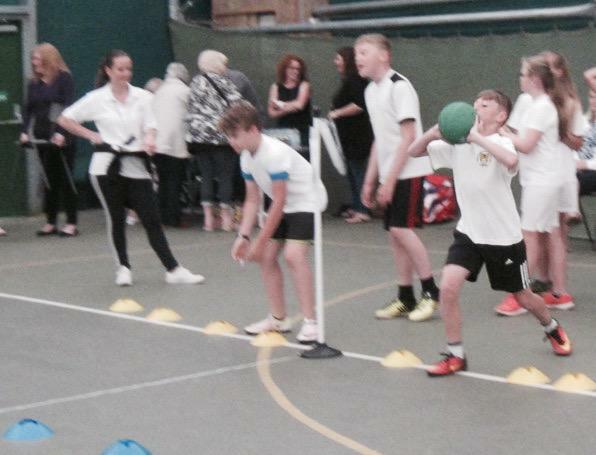 Well done to Charlie M, Eddy B, Ollie E, Gabe R, Ashleigh G-L, Harry E, Max J, George D, Cohen M, Jack R, Sammy C and Lochlin W.
On Tuesday, children from Years 4, 5 and 6 at Woodford took part in the annual C4L Dodgeball Festival at the Hele’s. 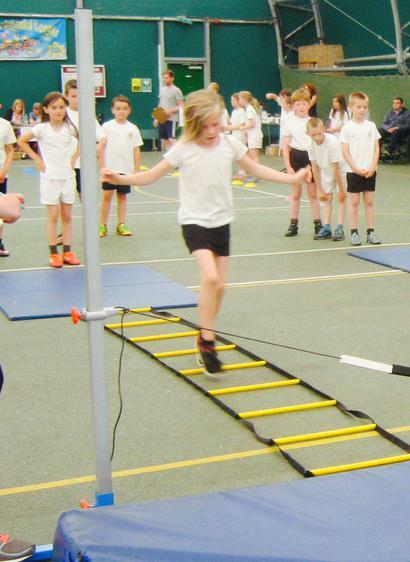 8 other schools took part in round-robin competition, including: Plympton St. Maurice, Pomphlett, Bickleigh Down, Hyde Park, Montpelier, Yealmpstone Farm, Old Priory and Tor Bridge Primary. 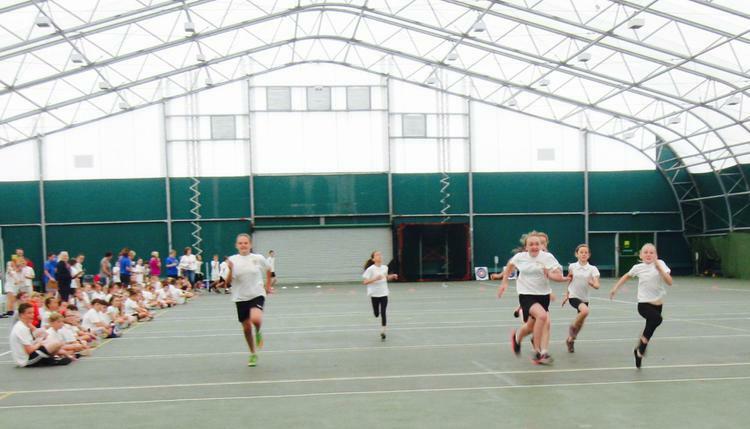 On Tuesday, some Year 5 and 6 children went to Hele's to take part in the annual Plympton Indoor Athletics competition. 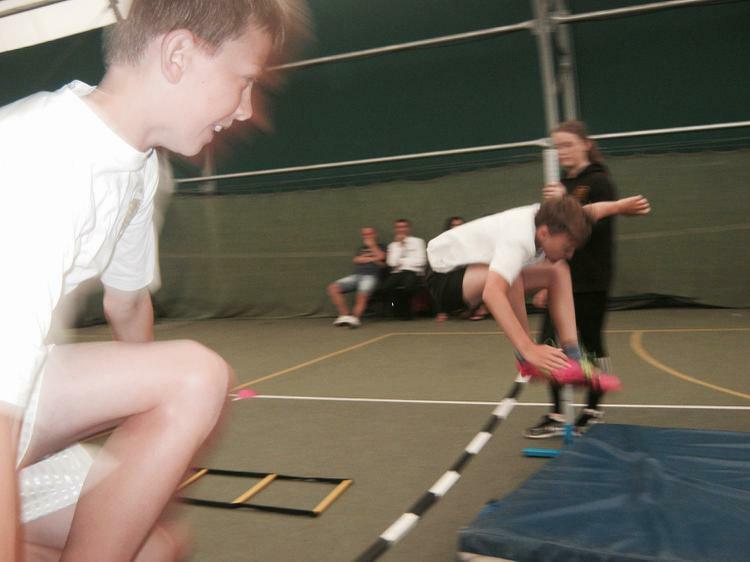 It was a mixture of track and field events, in which points were gained for the school. 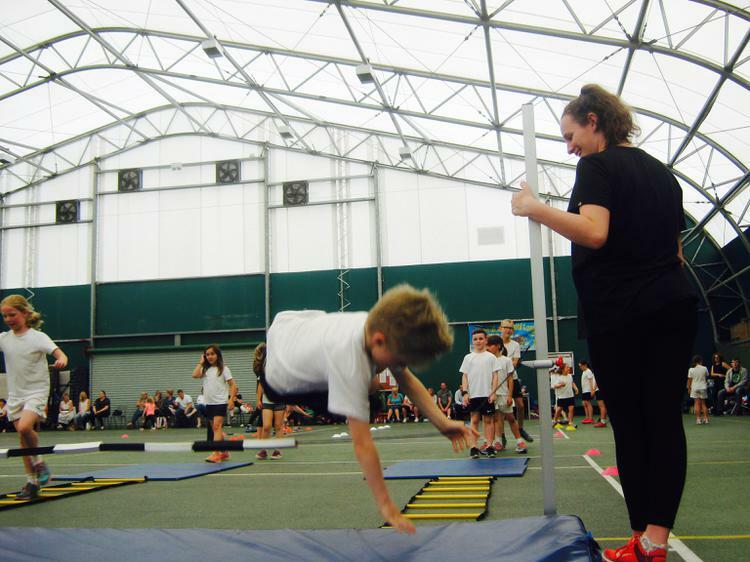 There were 9 events in total, including: 1x1 lap relay, 2x2 lap relay, 4x1 lap relay, 6 lap parlauf, obstacle relay, chest push, standing long jump, triple jump and speed bounce. 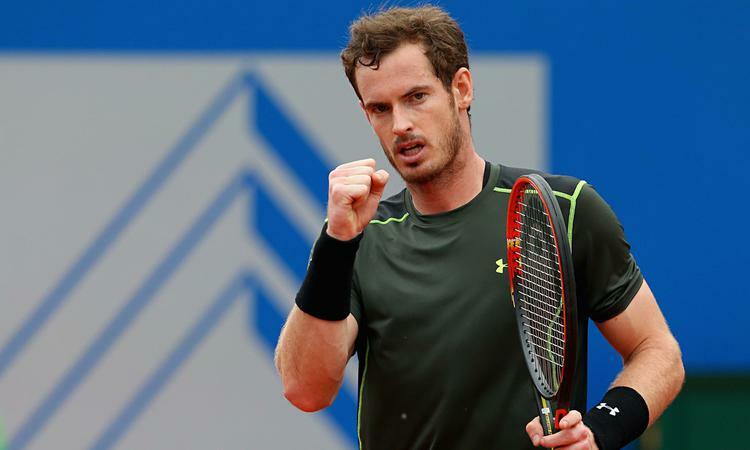 At the end, all the points were totalled and there was a tense wait to find out the results. Woodford ended up finishing in second place, narrowly missing out on winning by 2 points! Well done to Jodie K, Jodie B, Victoria L, Miah R, Sienna T ,Emily W, Spencer B, Ollie E, Luke R, Connor P, Gabe R, Eddy B. 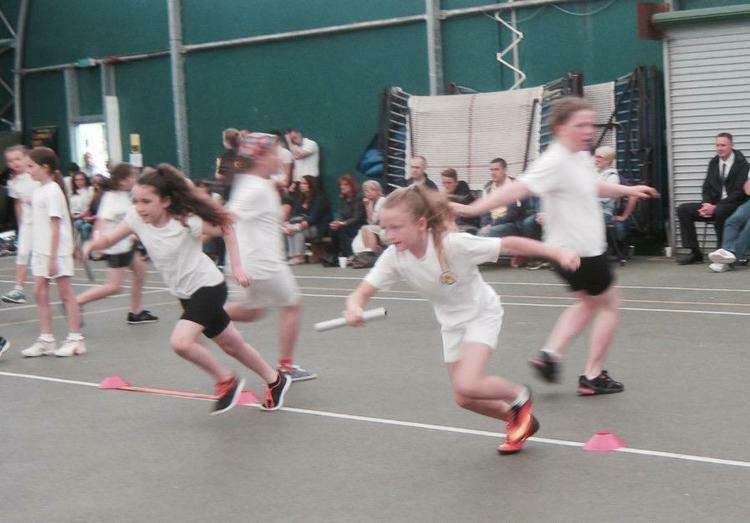 On Thursday this week, 12 of our Year 5 children attended the Year 5/6 PAT wide Quicksticks Hockey Festival at Boringdon Primary. 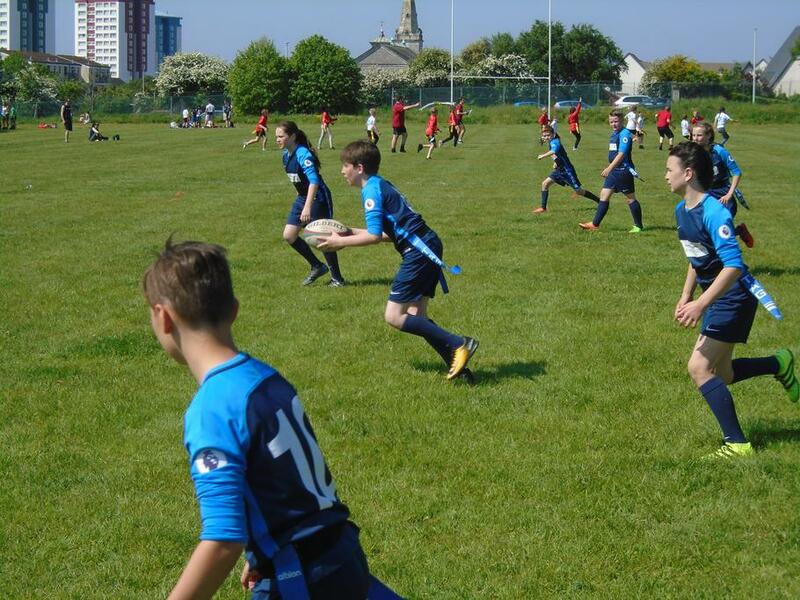 Our two squads competed in two groups of round robin fixtures. Both teams played with great determination and showed exemplary team work throughout; with their encouragement, positioning skills and adept finishing on display. Both teams picked up great victories in the group stage and our A team made it to the third/fourth place play off where the game ended in a 2 – 2 draw. It was an admirable effort from all of our children, some playing in a competitive format like this for the first time ever. The fact that the children more than held their own against other teams which had predominantly or all Year 6 children playing made it even more commendable! Well done for representing yourselves and the school so well - we look forward to more hockey opportunities in the future. 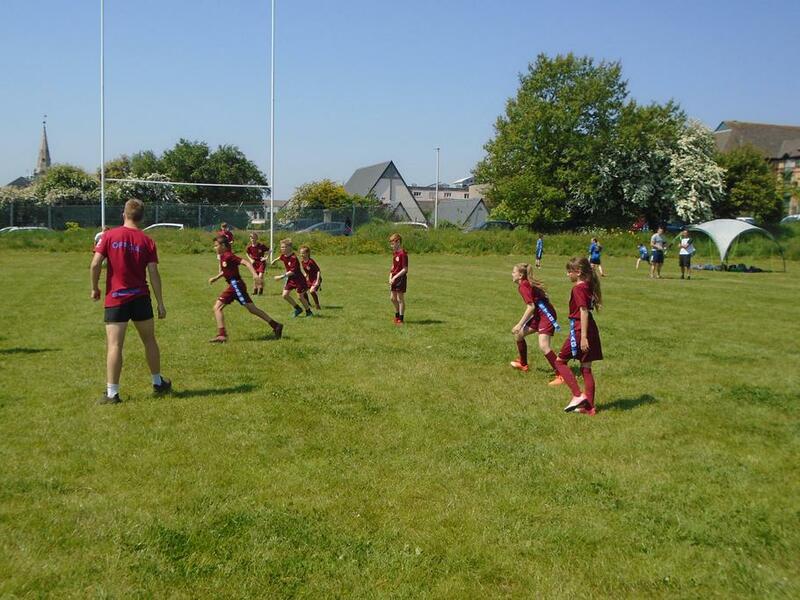 On Tuesday, a Year 5/6 team took part in a Tag Rugby Festival at Glen Park Primary School. 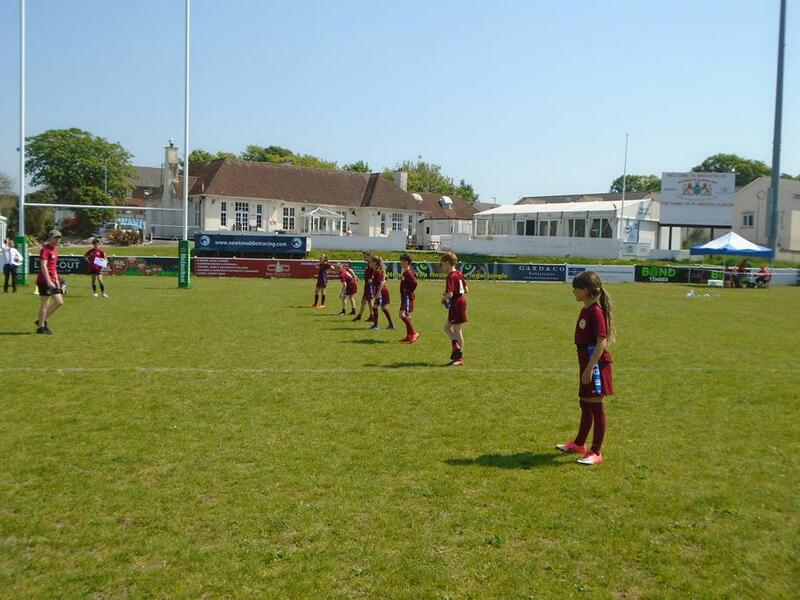 They came up against 3 others schools from the PAT, including Boringdon, Glen Park and Chaddlewood. 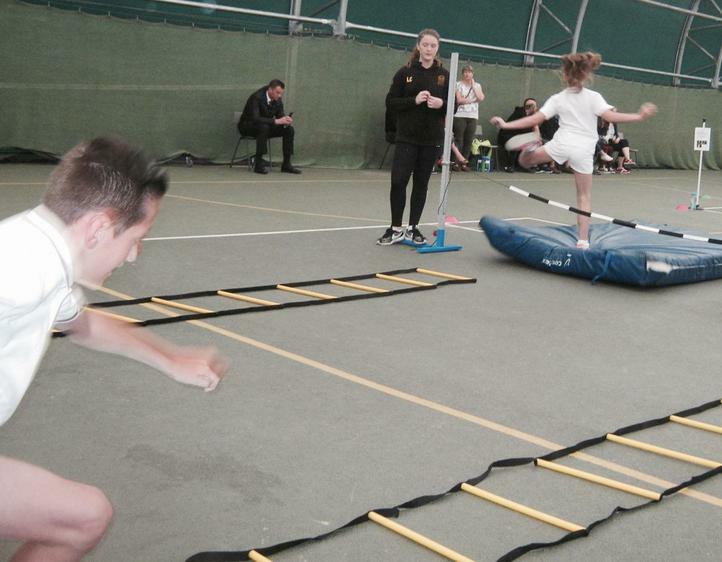 The teams worked their way around 4 practise stations initially, each with a different activity to complete. 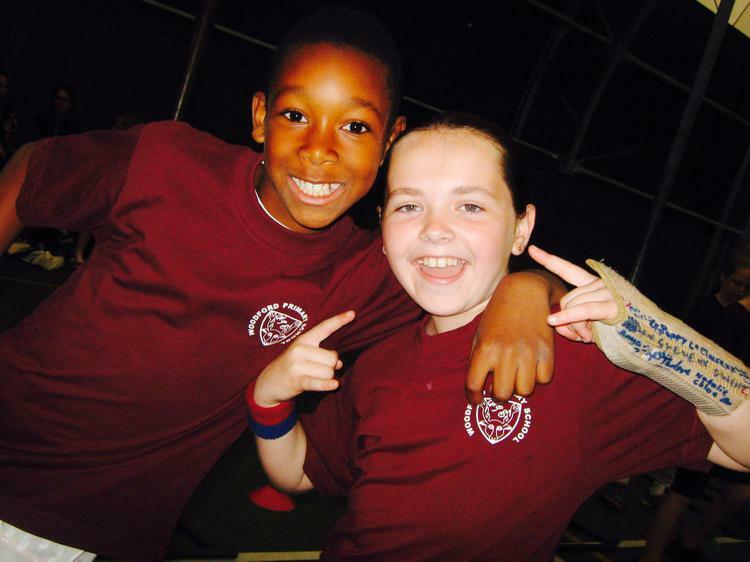 Afterwards, each school faced each other in a series of matches. 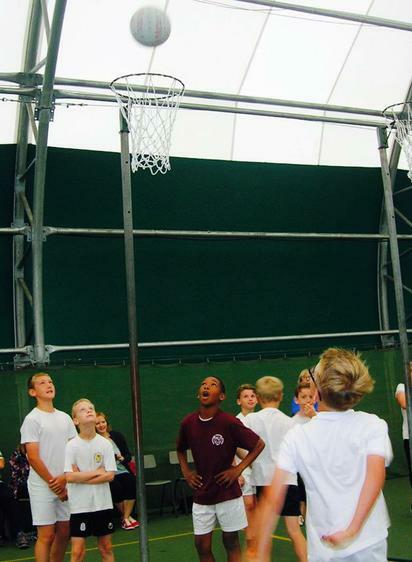 After wins against Boringdon and Glen Park, Woodford came up against Chaddlewood in what would be the deciding match. 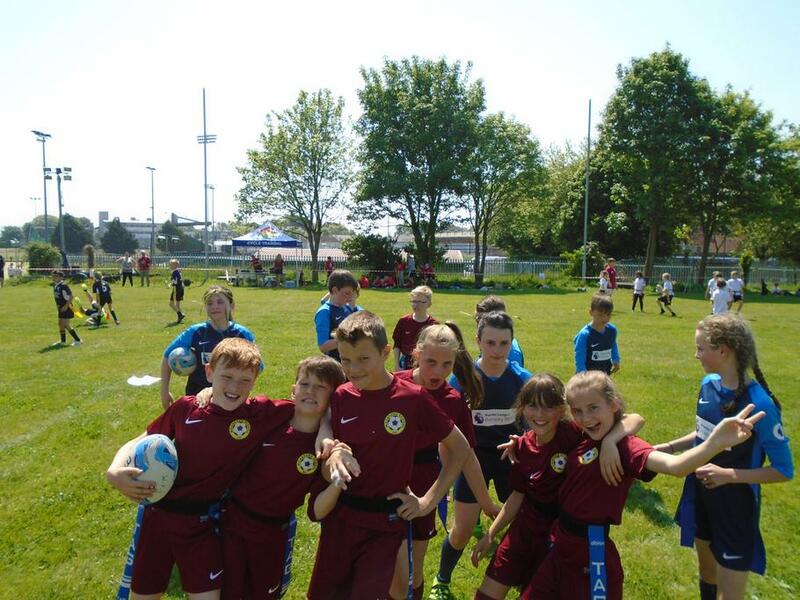 Woodford narrowly lost 7-5 but considering this was the first time that many of the children had even played tag-rugby before, they put up an impressive showing and this will stand them in good stead when they take part in the city-wide events later this year. At the end of the event, certificates were given out to everyone who took part and a Sports Superstar award was presented to one player on each team who demonstrated the most focus, athleticism and sportsmanship. Well done to Lochlan W for picking up this award for Woodford, and all the others who took part: Miah R, Ashleigh G-L, Victoria L, Gabe R, Ollie E, Connor P, Jack R.
WOODFORD WIN THE BIG PEDAL IN PLYMOUTH! 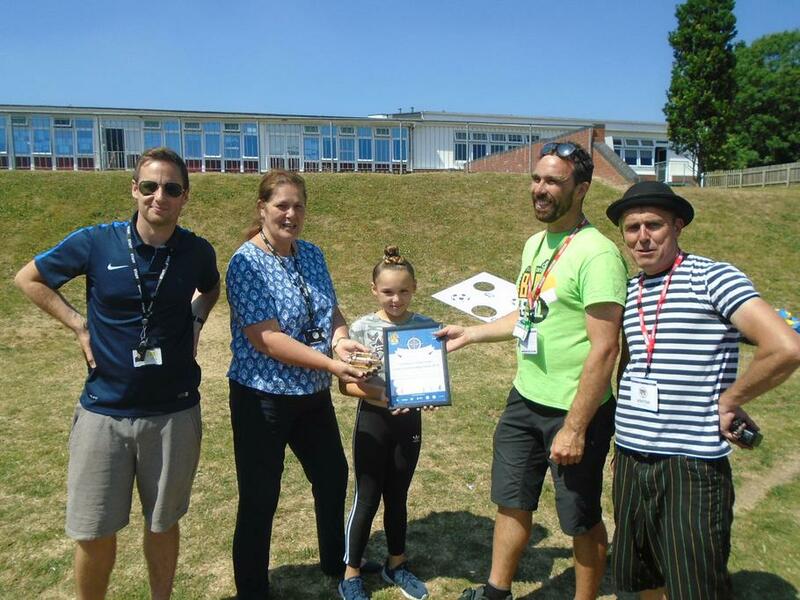 The Big Pedal 2018 was a great success, with Woodford finishing in first place overall in the Plymouth results category, thanks to logging an amazing average of 69% of pupils cycling or scooting to school during the 2-week challenge. This week, we received our prize, which was a unicycle stunt show from the fantastic Rupert Elford (aka Elfic the Jester). Thank you to everyone who helped us win the BIG PEDAL and remember to keep getting out on your bikes and scooters over the summer! 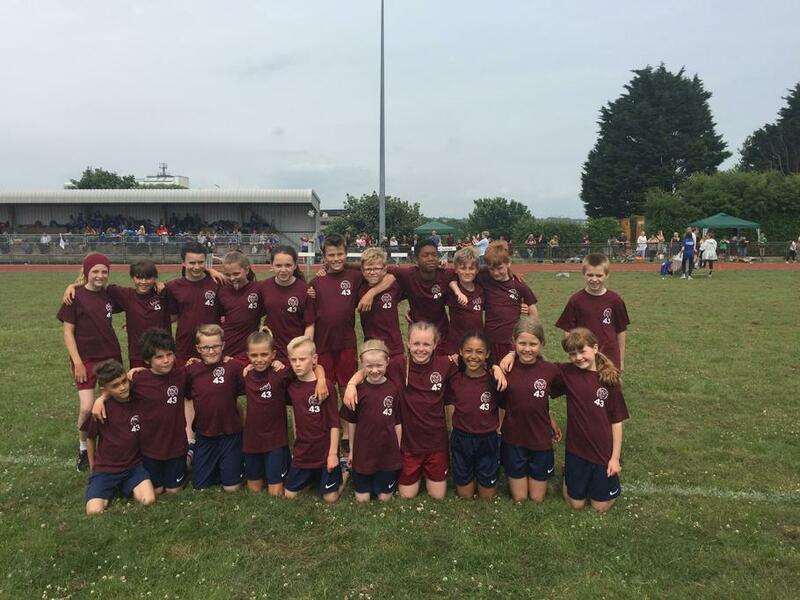 Our supremely talented athletics squad returned from the Primary Athletics Championships on Wednesday with an impressive haul of trophies and medals following a day of nail-biting competition at Brickfields. 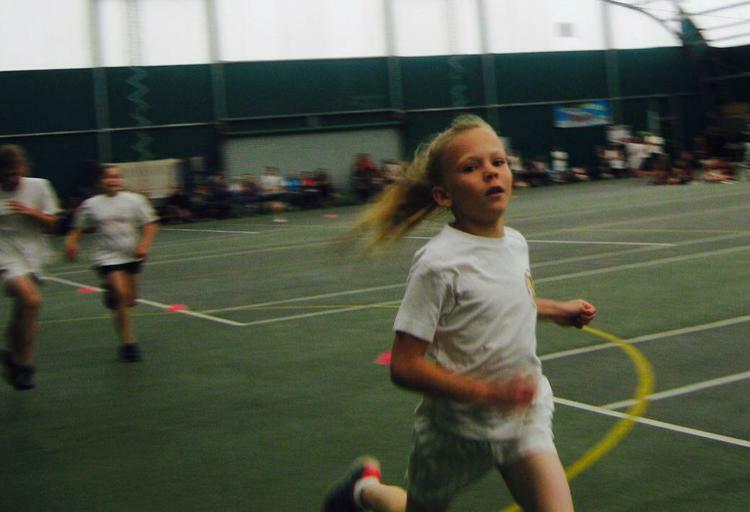 The day began at 10.00am with the individual sprint heats and field events and with our children competing against the best the city had to offer. After a long day, it culminated with us picking up the Trophy for Overall Champions—the very first time we’ve won since the trophy was first presented in 1977. 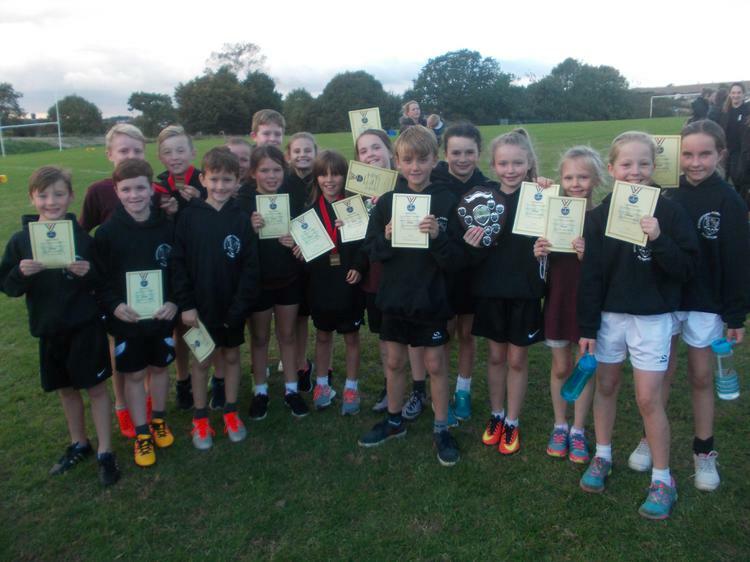 Along with the overall championship, our children also collected the Girls Year 3/4 Relay Trophy, the 5/6 Track Trophy and the Year 5/6 Field Trophy. In all, we won 4 out of 7 possible trophies! 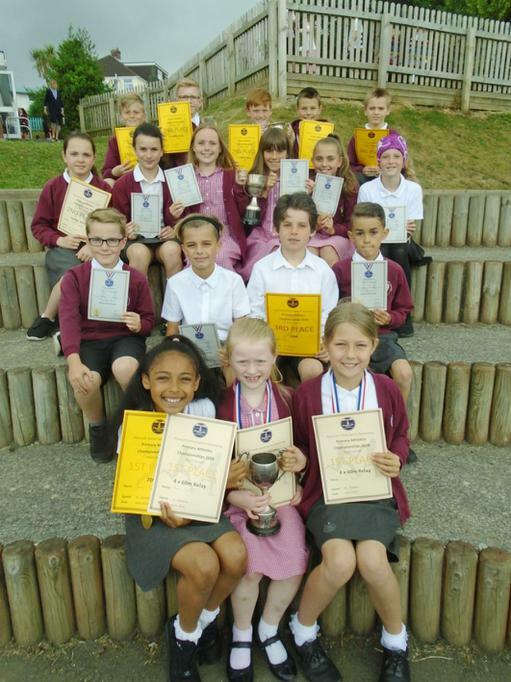 All of our children represented the school brilliantly throughout the day, displaying exemplary behaviour and sportsmanship and a competitive edge and resilience that saw them exceed all our expectations. 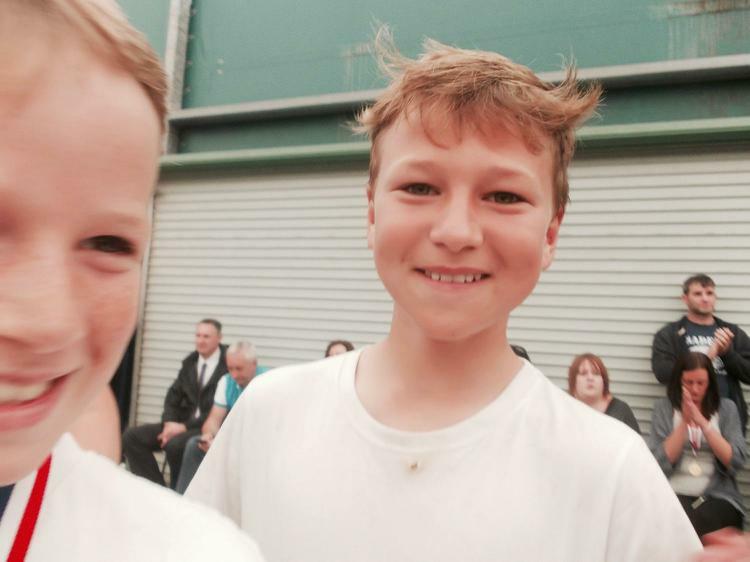 The following children placed in the top 3 in their events. Congratulations to everyone who participated. We’re all really proud of your attitude and efforts. Marley G, Issy McB, Eddy B, Jack R, Gabe R, Lochlin W, Sienna T, Emily Wi, Emily Wr, Connor P, Jodie B, Daniel D, Matthew J, J’adore L, Ewan McB, Nathaniel P, Evie A, Brooke B, Matilda R, Libby W, Phoebe Y. 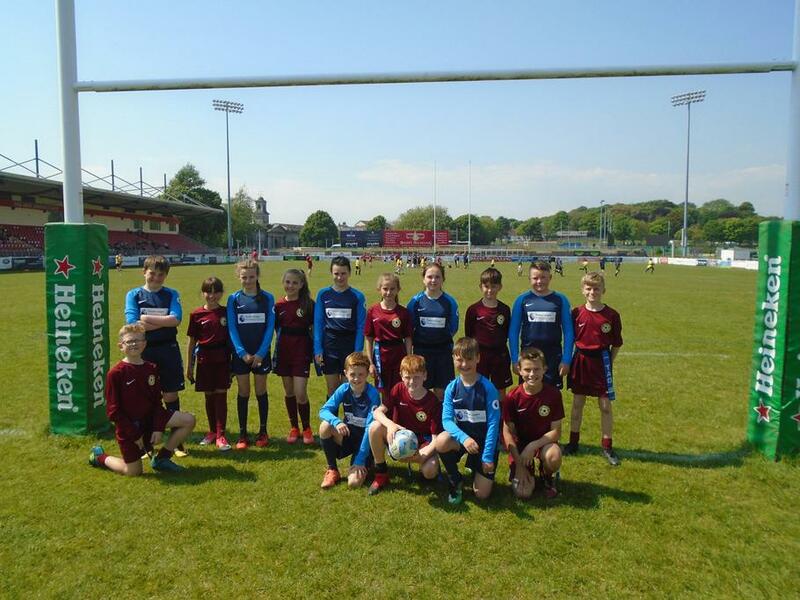 What a fantastic day it was at the annual Tag Rugby festival at Plymouth Albion today! 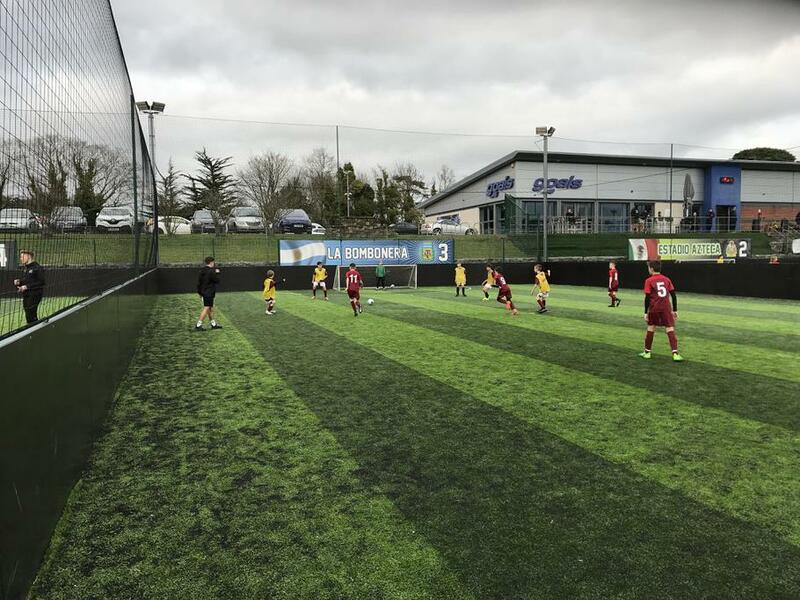 Two teams from Woodford took part in the event, with both successfully navigating their way through the morning group pool stages and into the winner's section for the afternoon games. Both teams played some outstanding, whole-hearted tag rugby and scored some amazing tries. In order to comply with the new RFU Age-Grade rugby rules, this event carried a 'non-competitive' format with no overall winner announced, but because there was still a Level 3 competition to qualify for, there was still much to play for as the top few teams would gain entry to this. 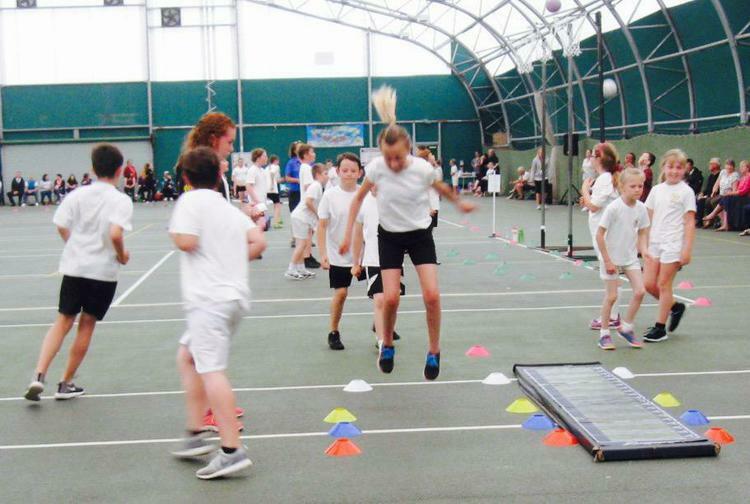 One of our Woodford teams won all of their afternoon pool games, chalking up some impressive wins in doing so, and have now qualified for the Level 3 Summer Games event, which is a superb achievement. 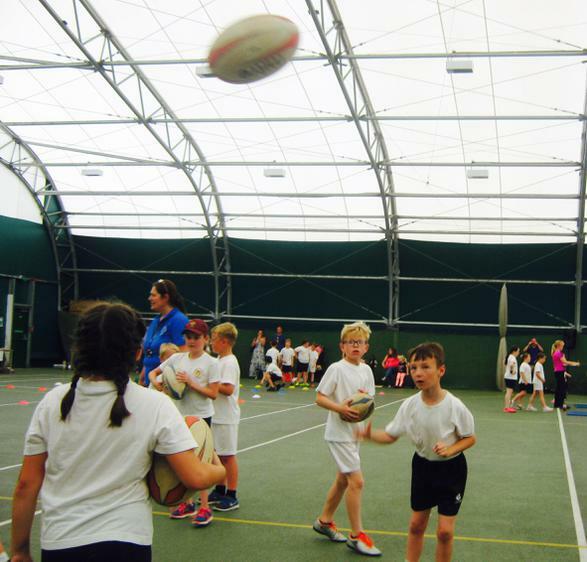 A massive well done to all the children who took part: they really did represent the school proudly and it was thrilling to see how much some of the children, who have only recently taken up tag-rugby at our after-school club, have improved in such a short space of time. 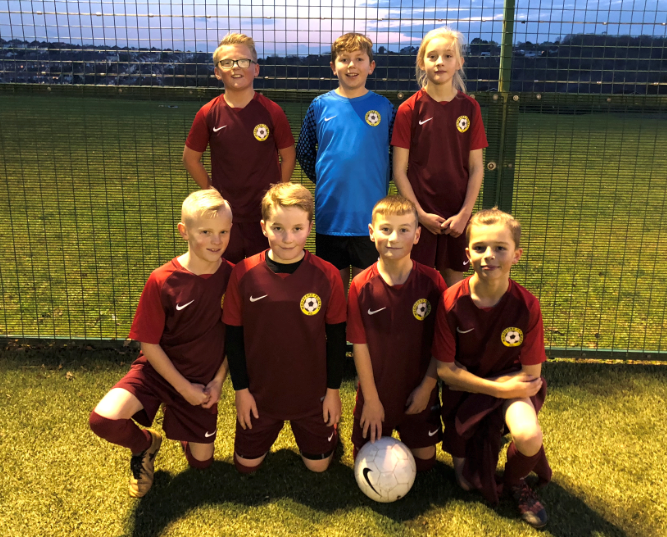 The Year 6 football team were invited to represent Plymouth in the PL Primary Stars Regional finals tournament at Coach Road, Newton Abbot on Monday afternoon. 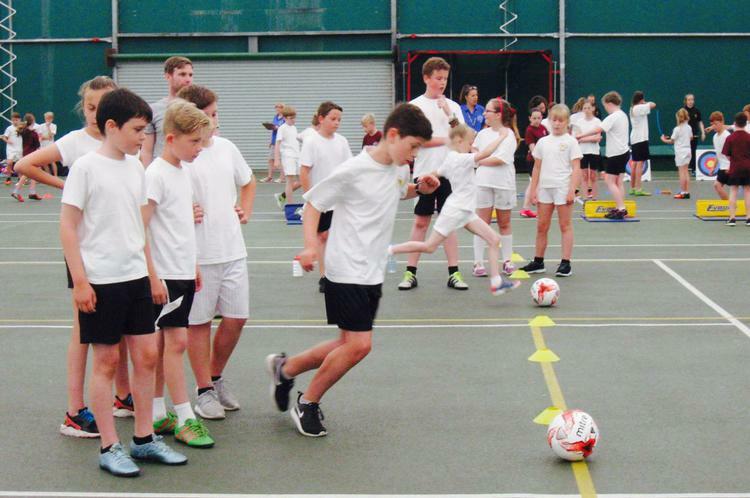 The tournament contained a mixture of schools from Exeter, Torbay, Torquay and the Plymouth region. 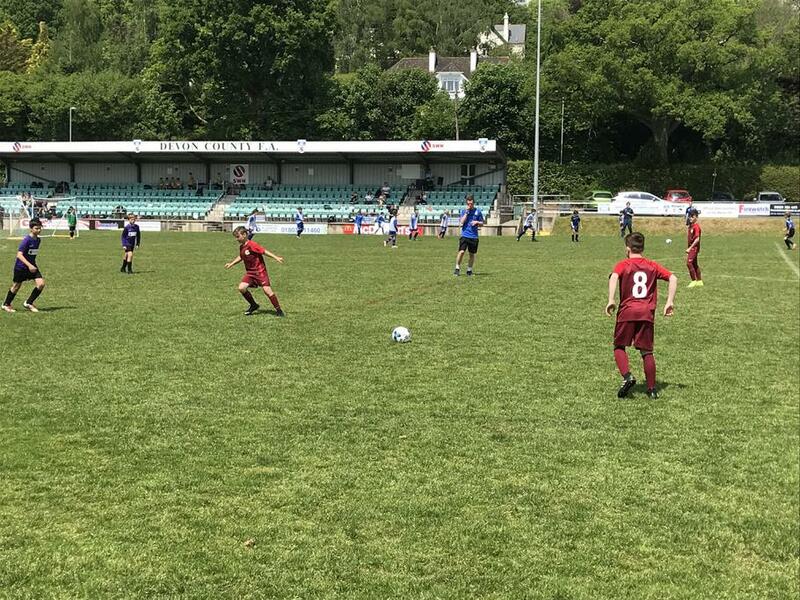 After racking up an impressive 4 wins and 2 draws from the group stages, Woodford reached the semi-finals, where they unfortunately lost 2-0 to Wynstream from Exeter. It was another great experience for the team however; they once again played some superb football and represented the school admirably. 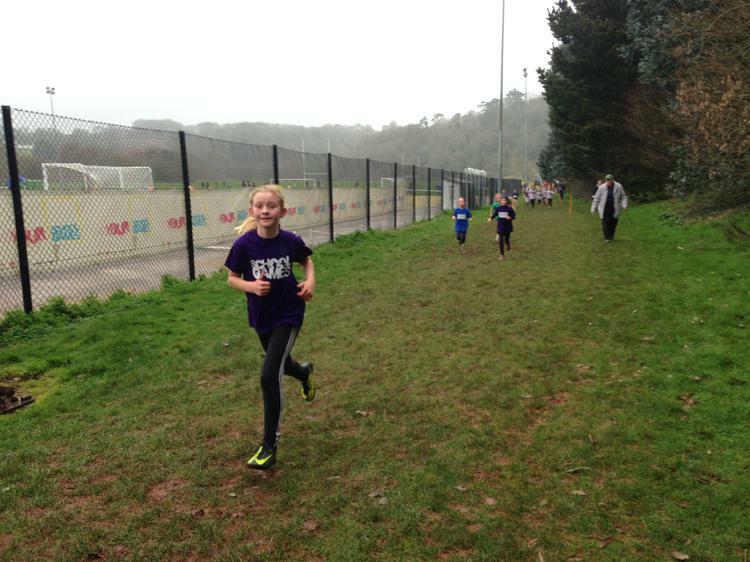 Well done to our 154 runners who completed the Plymouth Schools Half Marathon Challenge by running the final mile around the Hoe. They all thoroughly deserved their medals for the determination and perseverance they have shown in the build up to the final mile. 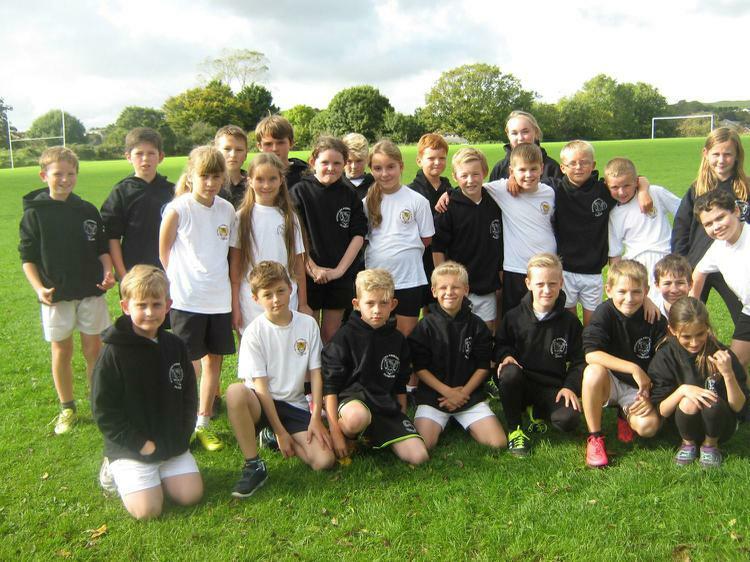 We are all very proud of them and that again, Woodford had the largest team of runners of all the schools in Plymouth. A special 'thank you' to the staff and parent supporters who had a great time running with the children. 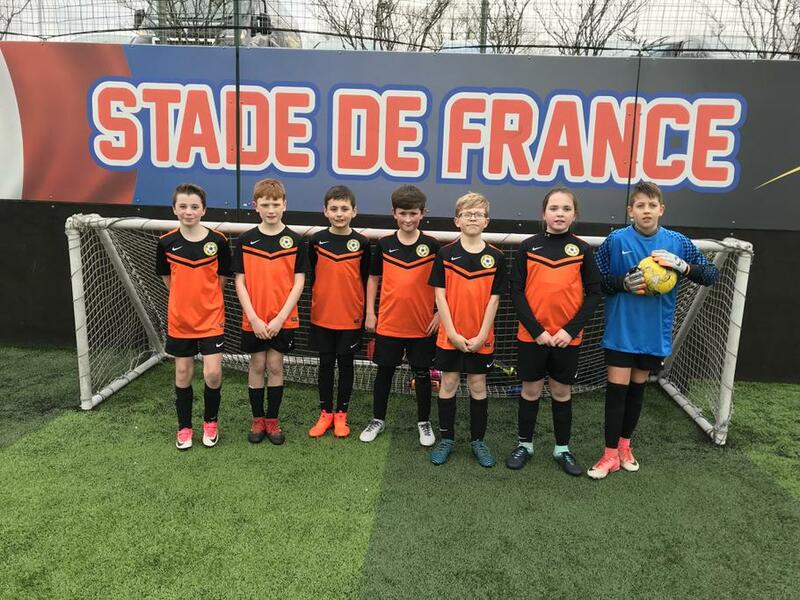 A huge well done goes to our Year 6 football team, who were this week crowned winners of the 2018 EFL Kids Cup. 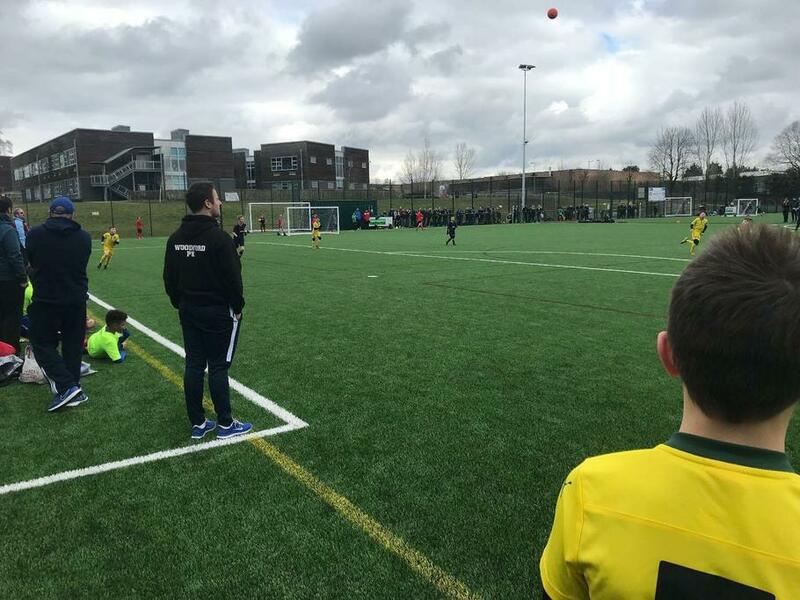 Having qualified with a 100% record from the first round on Monday, the boys returned on Tuesday as the tournament came down to a final league format involving the six best teams in the city. In a dramatic late twist, the tournament came down to the possibility of three teams being crowned champions as we entered the final round of fixtures. Woodford held their nerve to win comfortably, pushing Montpellier into the runner-up position. They will now move onto the regional finals being held in Oxford on March 5th, where they will represent the city. What an achievement boys - Well done! 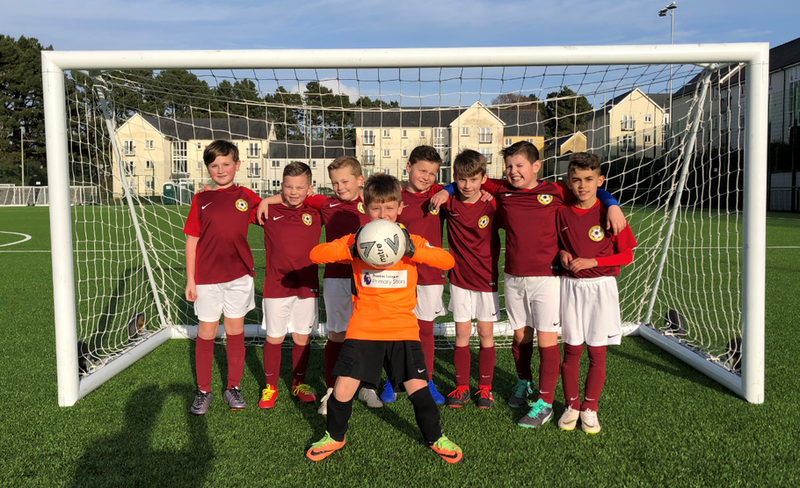 On Thursday evening, two Year 6 football teams took part in the Bettinson Trophy qualifying event at Plymstock 3G. 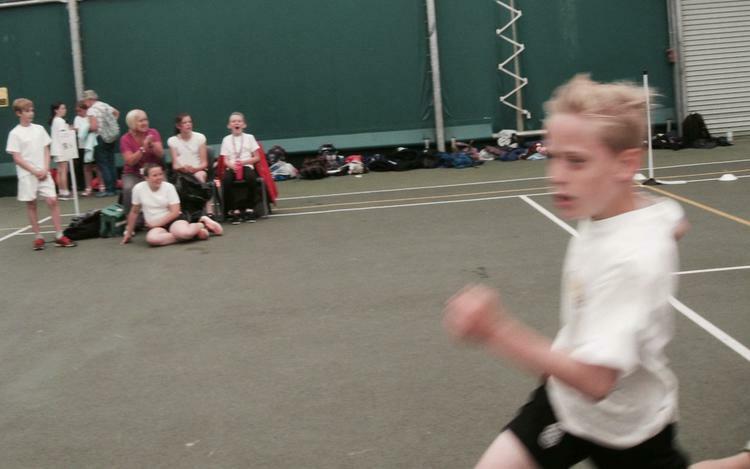 They came up against four other schools: Wembury, Newton Ferrers, Chaddlewood and Elburton. 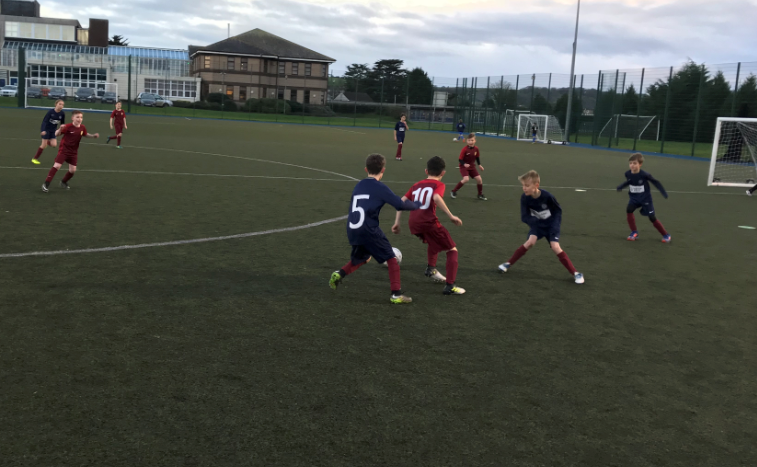 Both teams played some excellent football in what were biting cold conditions and one of our teams came out as the overall winners on the evening, meaning they now progress to the finals event early next year. Well done to all the boys who competed! 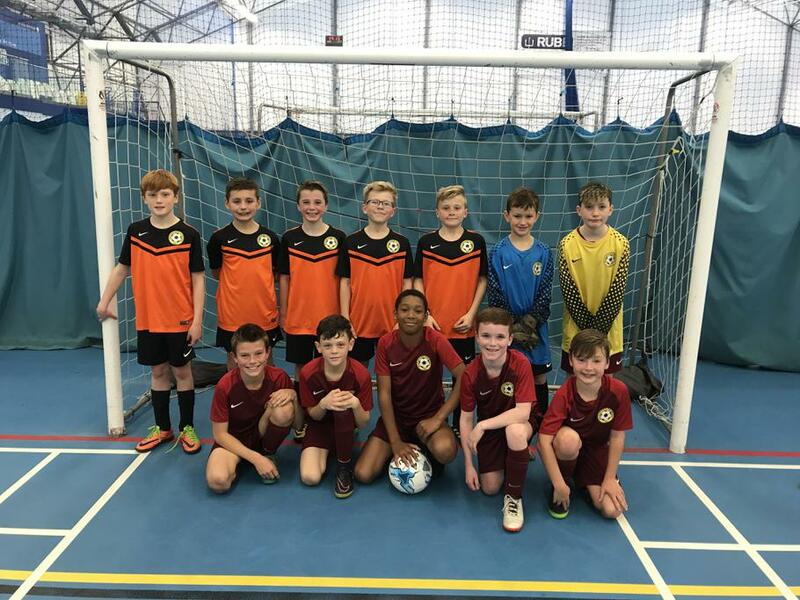 On Wednesday, some boys from Year 6 went to the Indoor Sport Hub in Paignton to represent Plymouth in the regional finals of Premier League Primary Stars futsal tournament. 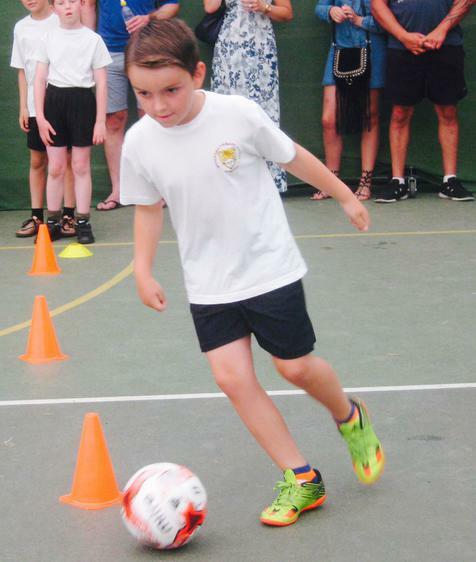 Some fantastic football was played by all, in what were fast-paced games of non-stop action. 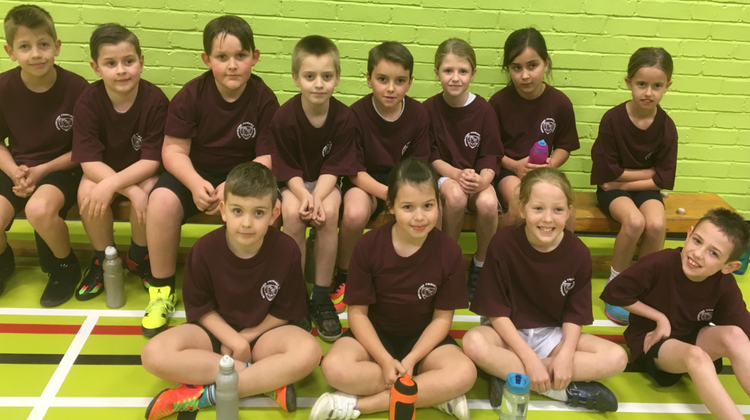 The children did the school and city proud, with one team reaching the semi-finals, before narrowly losing in extra-time. 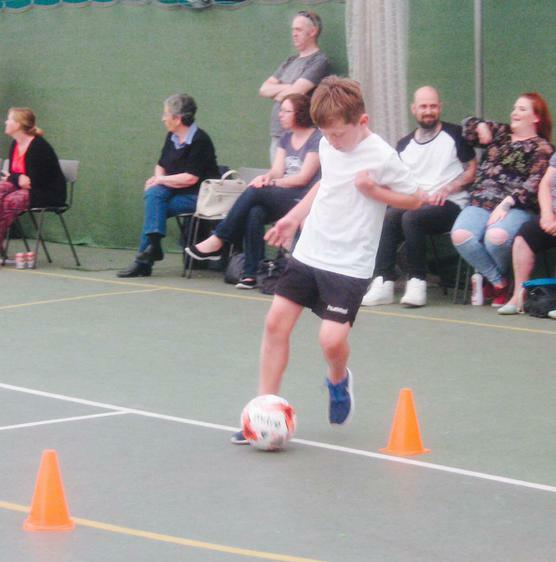 Well done to Ewan M, Matthew J, Harry R, Matthew J, Nathaniel P, Rory D, Charlie B, Daniel D, Billy M, J’adore L, Owen C and Cameron P.
On Wednesday, pupils from Year 5 & 6 took part in the Primary Inclusion Football festival. 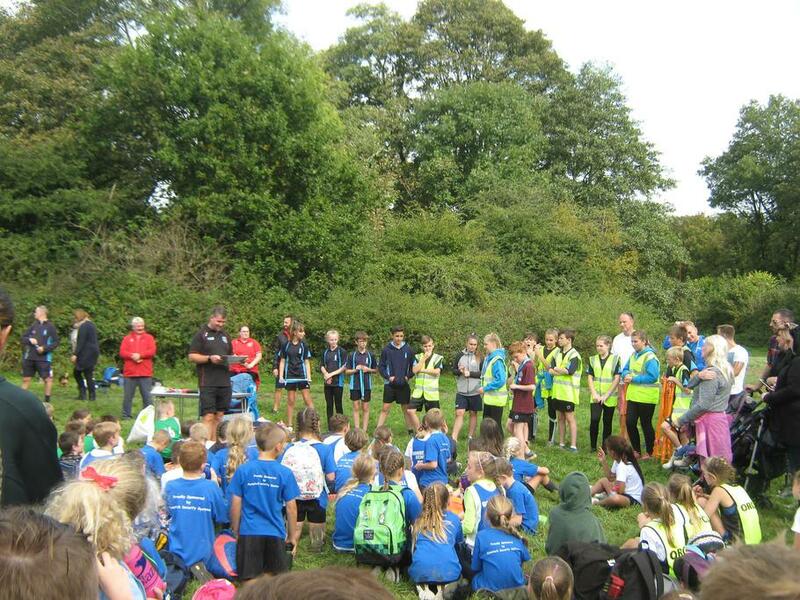 There were 9 other teams taking part from Oreston, Stoke Damerel Primary, The Cathedral School, Plympton St. Maurice, Elburton, Glen Park, Old Priory, Pomphlett and Cann Bridge. 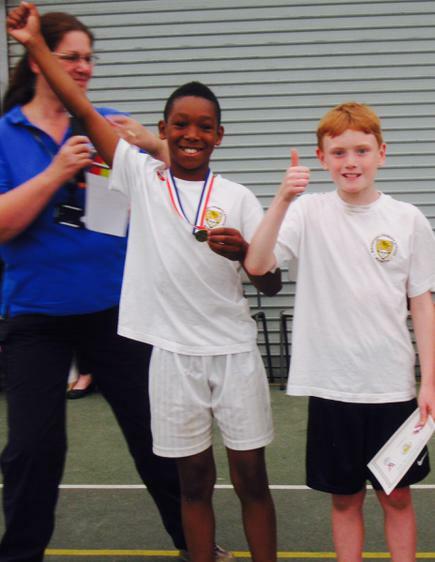 There is a competitive element to this event and there is an overall winner but this is never the only focus on these day; it is also an opportunity to celebrate many of the PSSP School Games Values and put a particular emphasis on Respect, Determination and Team Work. 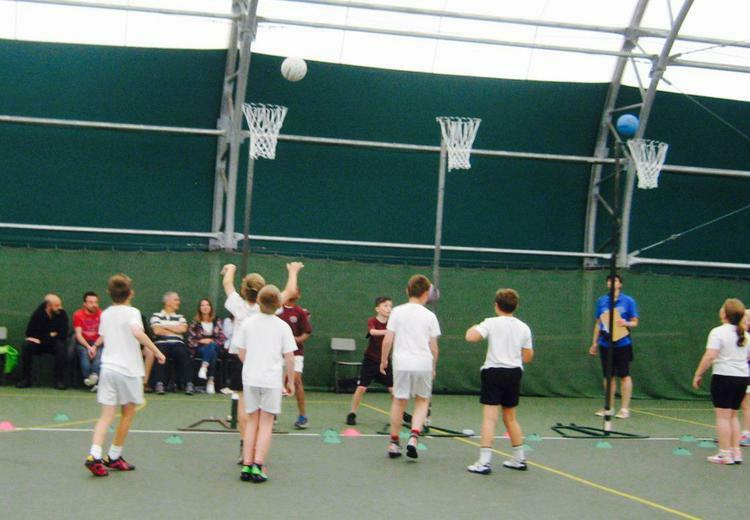 The overall winning team was Woodford who racked up hugely impressive 41 points. Congratulations to our winners, who played some excellent football and even more importantly, showed some outstanding displays of teamwork, sportsmanship and respect for others. Well done to Janie W, Amy B, Abbie M, Toby W, Jack H, Connor H, Ewan V and Harry D.
What a week or so it’s been for our cross-country team! 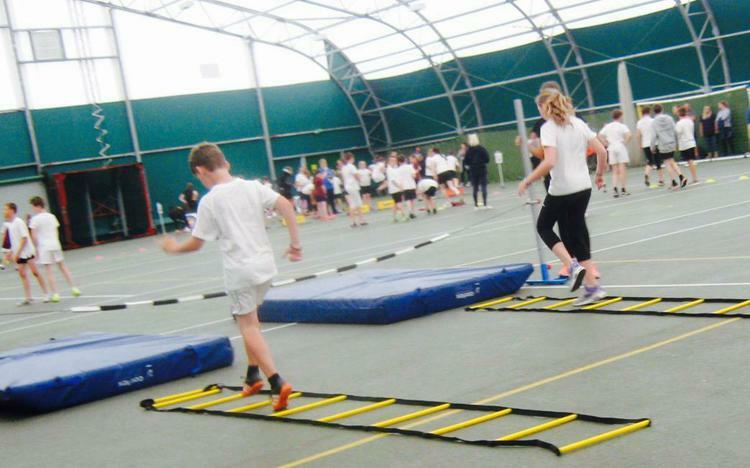 We’ve attended events at Eggbuckland Community College, Hele’s School and Coombe Dean School and have represented ourselves superbly on each occasion while also enjoying some great success. 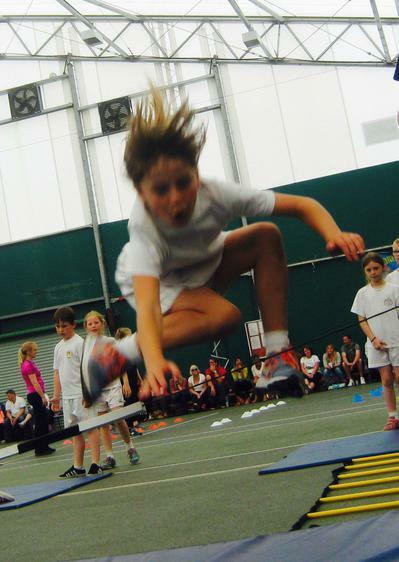 At the moment all of our teams (year 3/4 girls, 3/4 boys and 5/6 girls and 5/6 boys) hold a place in the top three amongst all schools in the city and we’ll hope to stay there as the results from last nights final event at Coombe Dean are calculated. 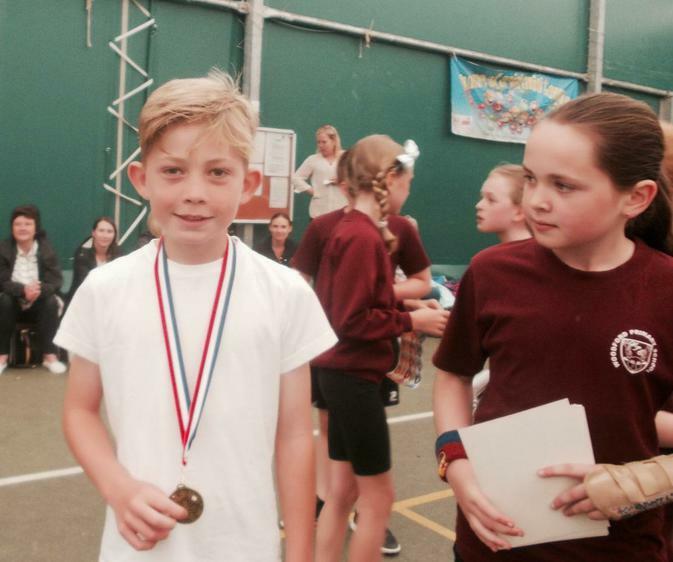 We need to give a special mention to Sienna T and Lochlin (both year 4) and Phoebe Y and Ewan M (both year 6) who have all taken home medals for their individual performances. 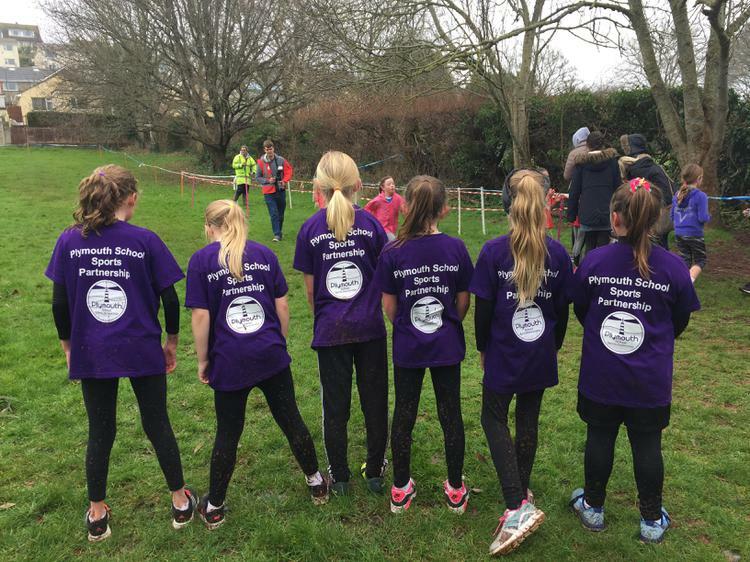 Cross-country season ends with the Plymouth Cross-Country Championships at Staddiscombe next week so well done to all the children who have worked so hard over the last few weeks and good luck next Thursday! Well done to the girls of Woodford, who won the Bettinson Cup football tournament this week! 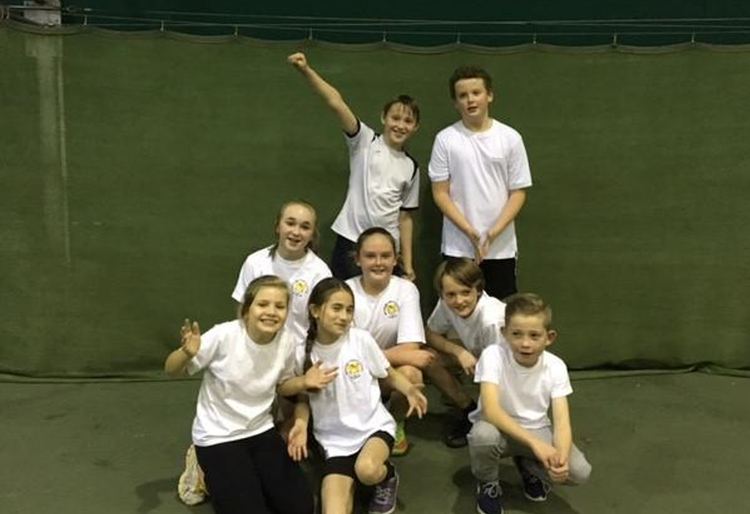 After winning their qualifying event at Plymstock last week, they reached the final four and came up against Drake, Hyde Park and Manor Primary in the finals event at Eggbuckland. We won 2 games and drew the other, which meant Woodford won the trophy and now go on to compete in the regional finals later this month. Congratulations to Maddie, Lily, Katy, Cerys, Ashleigh, Sophie, Matilda, Brooke and Libby! 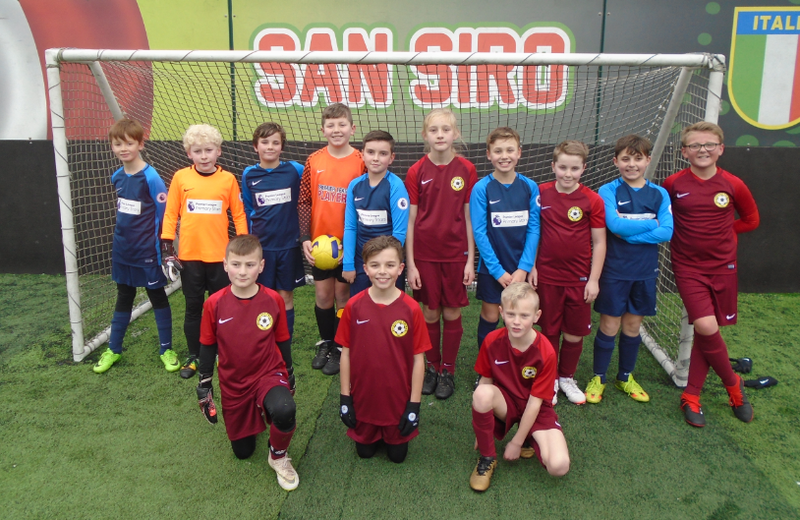 Children from Year 5 and 6 competed in the first ever Primary Stars Community Cup football tournament at Goals on Monday. 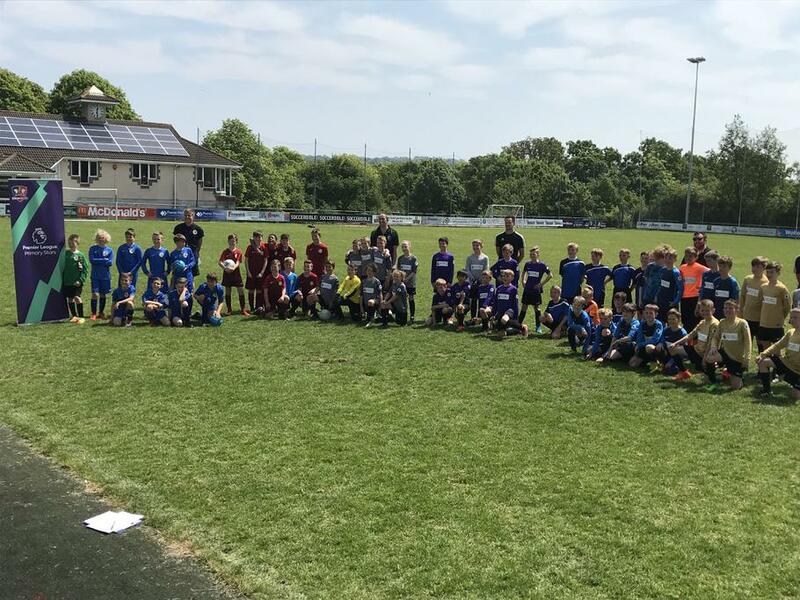 The Year 5 and Year 6 teams both navigated their way out of the group and knockout stages and into the final, where, incredibly, they came face to face with each other in an all Woodford final! It was an enthralling, end to end game which the Year 6’s ended up winning 6-3. The real winners were the school though, who the children did proud, playing some outstanding football and participating with great sportsmanship throughout. A big well done to all those involved, who now go on to compete in the Regional finals in Newton Abbot next month. 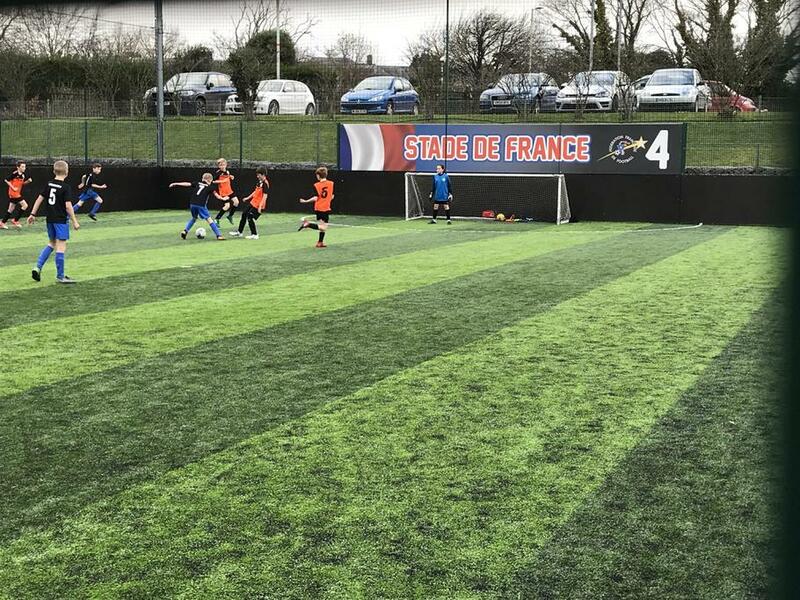 Children from Year 5 and 6 competed in the EFL Community Cup football tournament at Goals on Monday. They all did the school proud, participating with enthusiasm, effort and sportsmanship. The Year 6 team reached the semi-final, unfortunately losing a close-fought game against the eventual winners, Elburton. A big well done to Billy M, J’adore L, Charlie B, Owen C, Libby W, Rory D, Daniel D and Cameron P in Year 5 and Alfie F, Sam N, Ollie H, LJ, Mason E, Billy E, Sam R and Harvey S in Year 6. 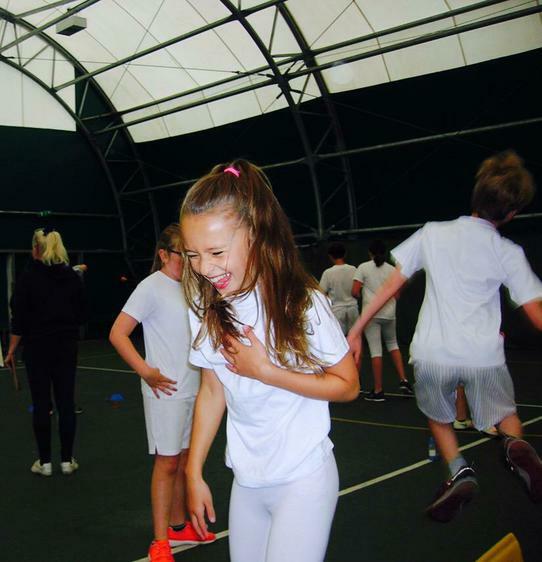 Every Thursday, for a period of 6 weeks, some of us will be taking part in gifted and talented, booster PE sessions at Plympton Academy. 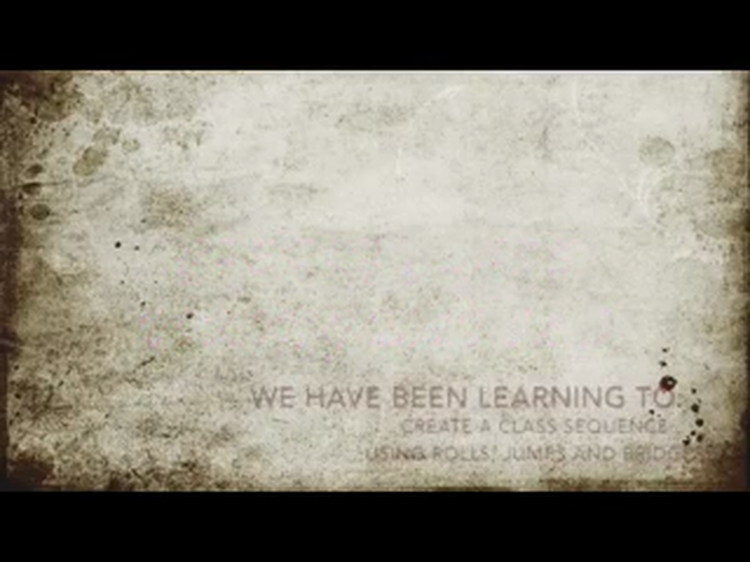 So far, we're half-way through the sessions. 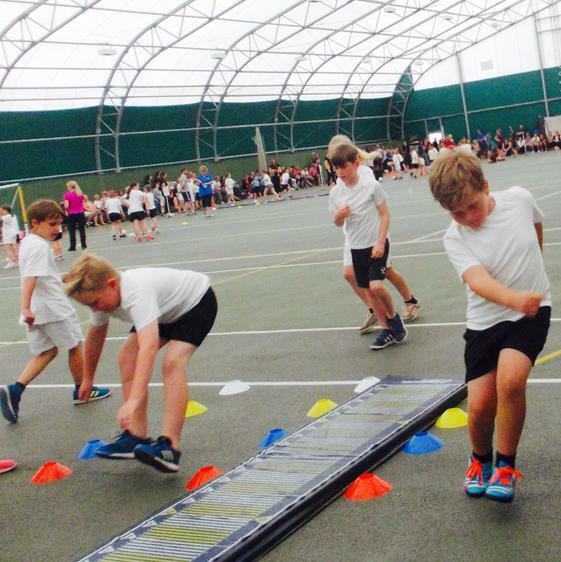 Each week, we have been doing different types of activities with their PE Leaders. 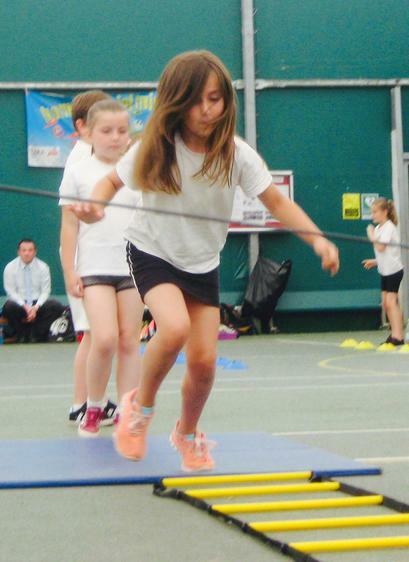 We have been learning all sorts of new skills such as agility, balance, hand-eye co-ordination, speed and reaction times. Next week, the leaders will introduce iPad's and speed guns to help improve our our performance. 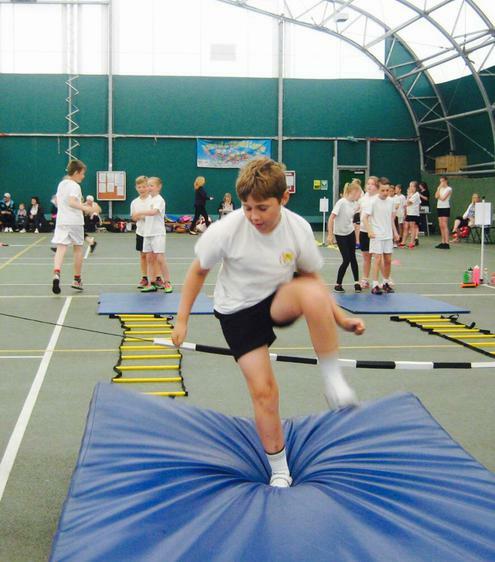 On Monday, 24 of the year 5 and 6 children at Woodford went to an indoor athletics competition at Hele’s. 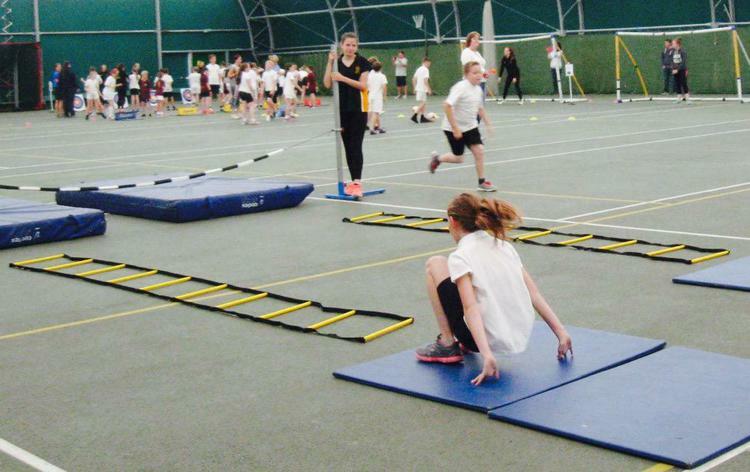 This included running races, obstacle courses, chest push, speed bounce and long and triple jump. It was really fun but also really tiring (and also a bit frustrating as penalty points were awarded for errors). 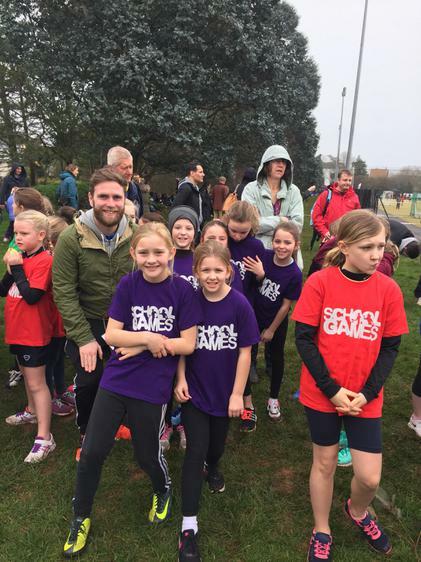 In the end, our year 6 team—with a few helpers from year 5 - finished 2nd, just behind Boringdon, and our year 5 team finished 5th. At the moment, we’re waiting to see if we qualify for the level 2 event as best runner-up. 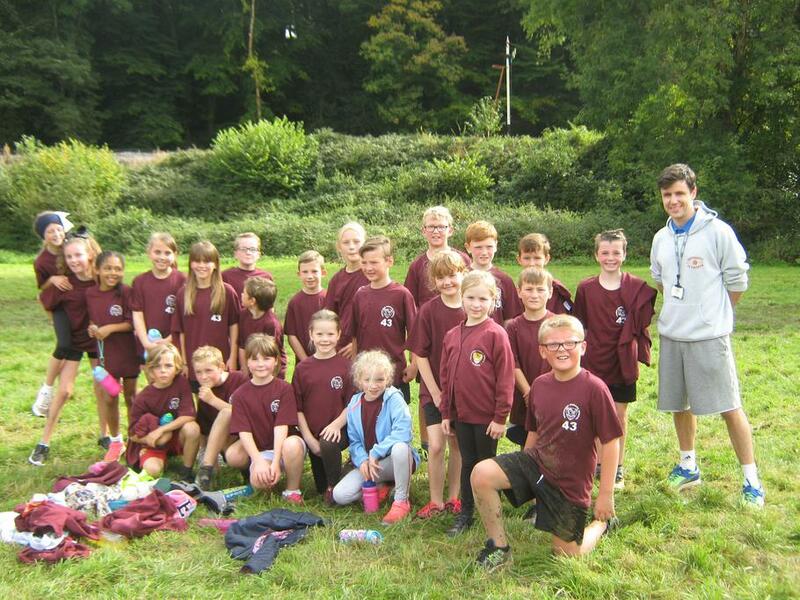 Some of our amazing athletes in year 5/6 attended a cross-country challenge at Plymbridge Woods this afternoon. Well done to everyone who participated as our boys came 4th and our girls finished 7th. 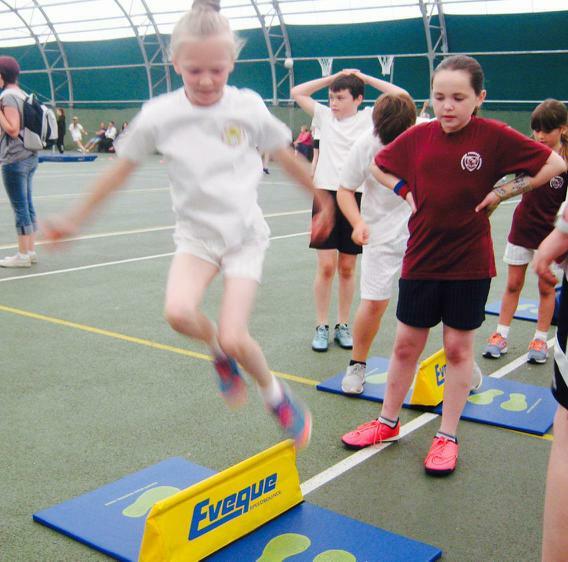 Last Wednesday, our athletics club's year 3/4 children, and Mason from year 5, went to the Brickfields Primary Athletics event. While we were there, we competed in different track and field events. 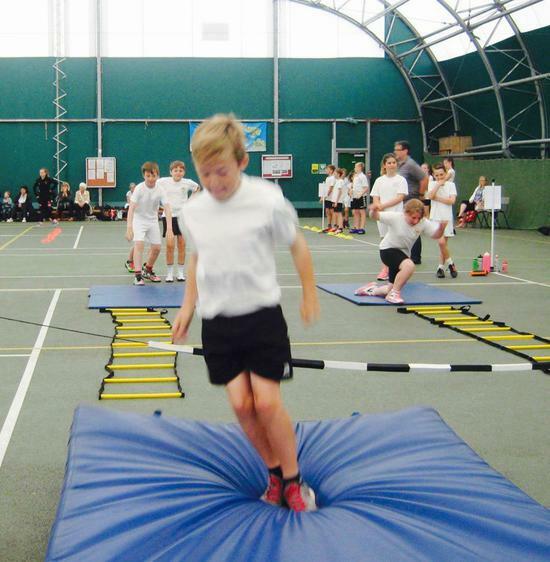 Libby and Nathaniel competed in the vortex, Phoebe and Billy did the vertical jump and J'adore and Sophie took part in the long jump. Everyone did really well given that we are year 4's and were up against year 6's because Woodford's year 6's were at Heatree. 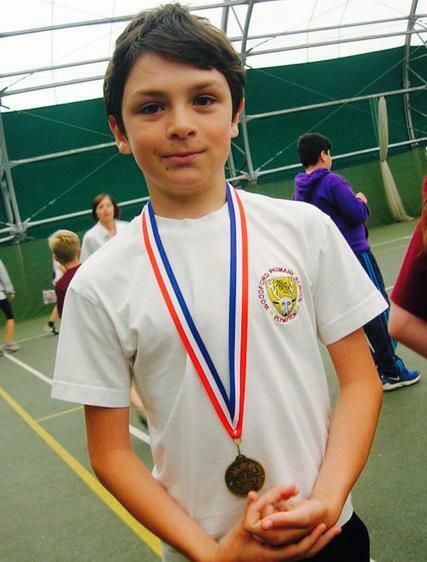 On the track, Ewan made the final of the boys sprint, finishing second in the end which is a superb achievement. Our boys relay team also made their final, finishing 4th, while Brooke finished 3rd in her sprint heat and the girls relay team finished 3rd in theirs, just missing out on a place in the final. 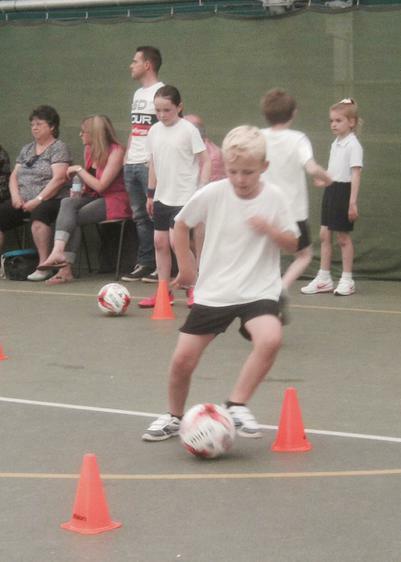 Well done to Max and Ashley in year 3 and Mason in year 5 who also put in great efforts. We all had a great time and are looking forward to doing it again next year. By Phoebe and Nathaniel (Cherry class). 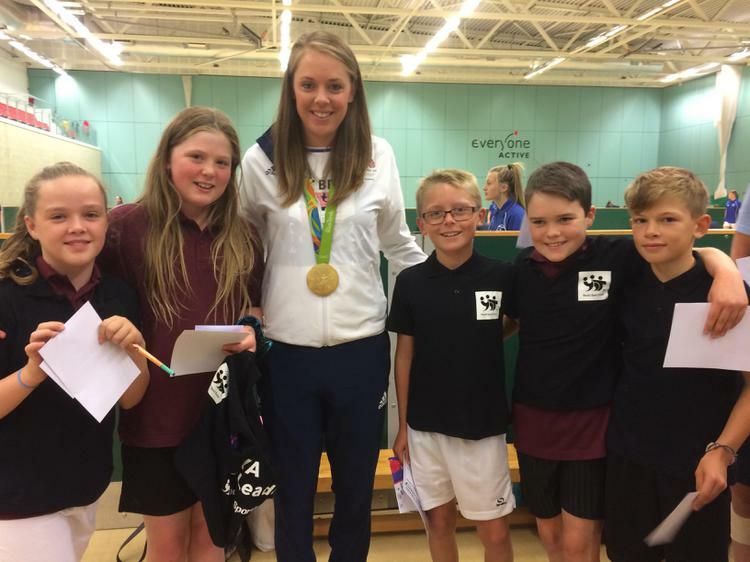 Our year 5/6 swimming gala enjoyed tremendous success at the Plymouth Leander Swimming Gala on Friday afternoon. The team swam in individual 50m and 25m freestyle, breaststoke and back crawl races as well as 4 x 25m freestyle relays (boys and girls) and an 8 x 25m, mixed gender, freestyle relay. Several PBs were smashed as we picked up a huge number of certificates for top 3 finishes including 2nd place in all 3 relays. 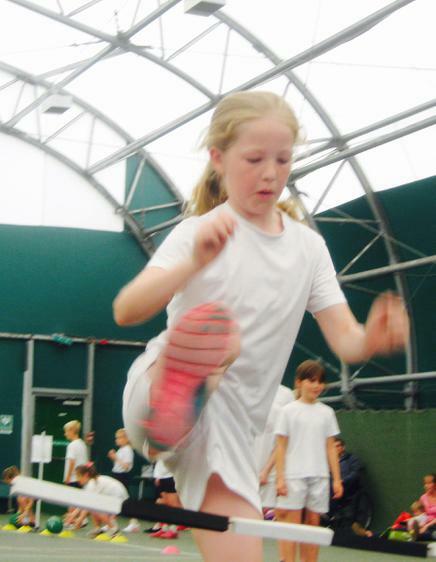 Well done to Hannah, Tia, Mia and Carys in the girls' team and Ben W, Danny, Matthew and Samuel in the boys' team. 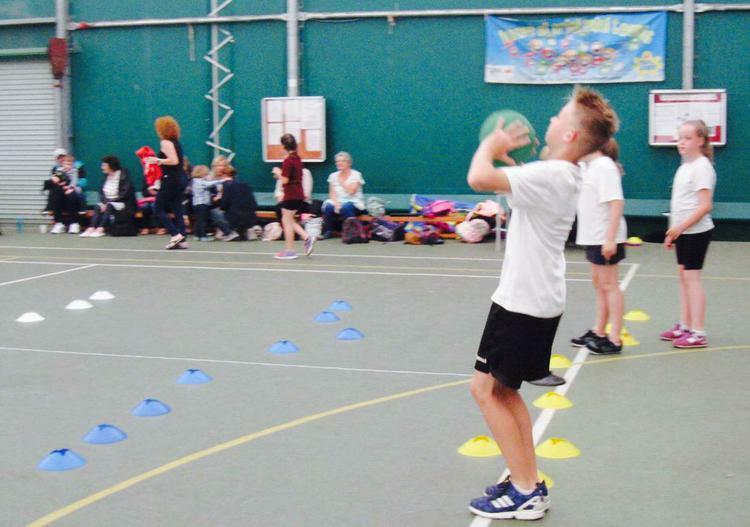 This week, our rounders club have been involved in two different city-wide tournaments. 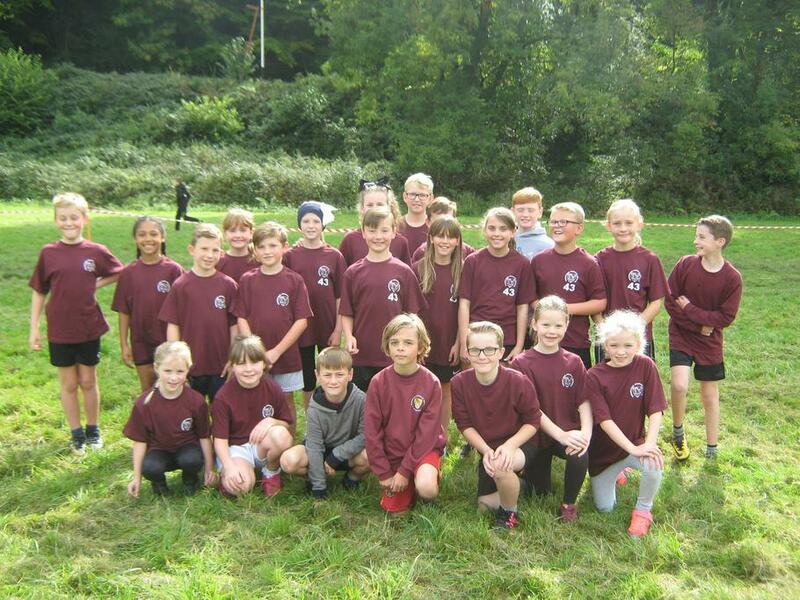 On Tuesday, one team went to the level 2 Primary Rounders Competition at Stoke Damerel winning all but one of their games to finish 2nd overall. 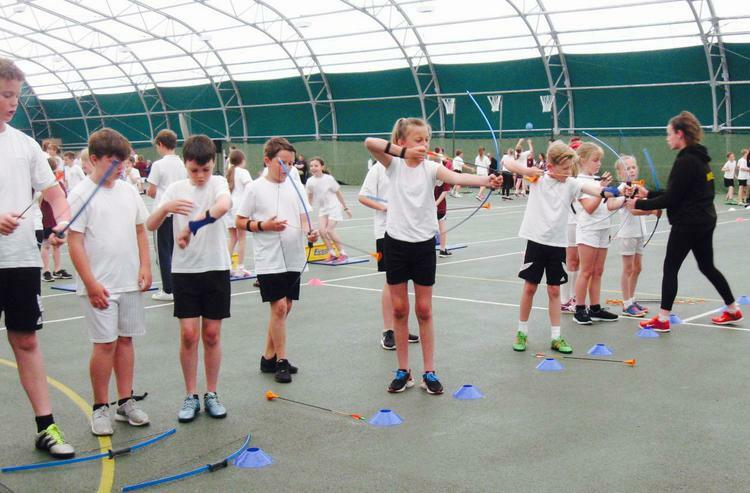 This excellent achievement means that the team have qualified for the Devon Schools Summer Games to be held at Exeter Arena on the 29th June, where they will compete against the other qualifiers from all over Devon. Well done to Lloyd, Tyler, Matthew, Harrison, James, Fin, Alfie, Erin R, Grace, Tilly and Millie! 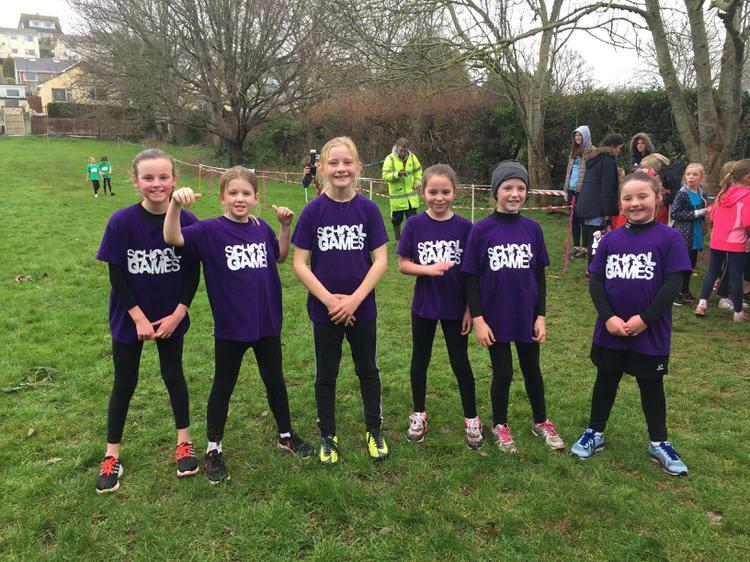 Not to be outdone, another team went to the Plymouth Rounders Festival at Coombe Dean on Wednesday and again finished second in league standings. Well done to Danny, Patrick, Ralph, Dylan, Jacob, Erin R, Grace, Hannah, Libby and Carys! 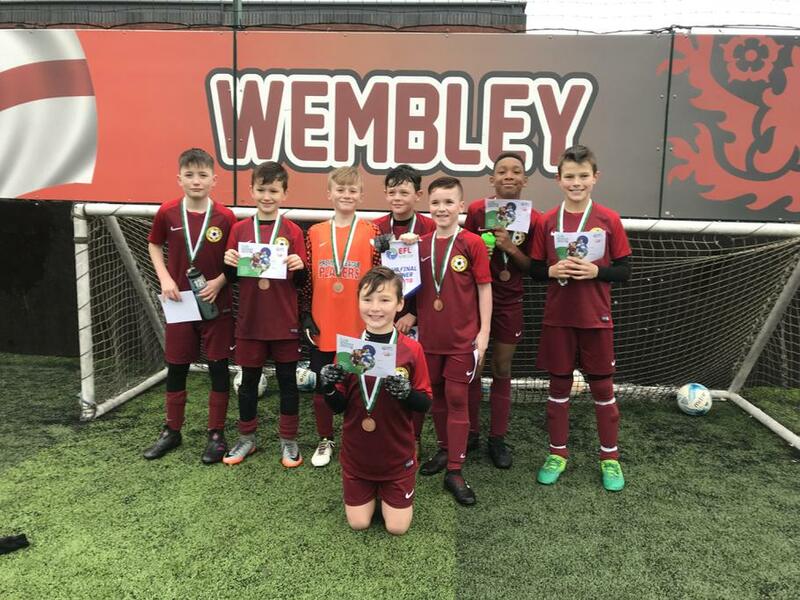 The boys also represented Plymouth Argyle at the Football League 2 (Southern) Under-11 Competition as a result of their success at Goals. Well done boys! Cherry class have produced a superb 'Viking Battle' scene during their gymnastics lessons. The children have been learning to move in different ways, including jumps, rolls and have also been creating static bridges too. In the battle, the children have planned, rehearsed and prepared freeze frames, and developed ways of moving into and out of those freeze frames. Well done Cherry! 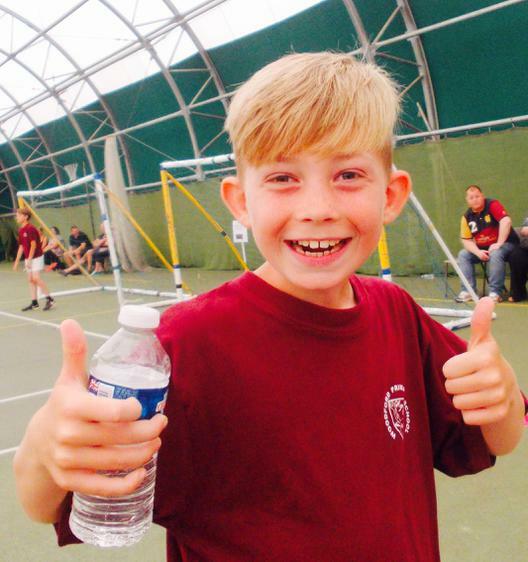 FREE TENNIS AT PLYMPTON TENNIS CLUB!! Plympton Tennis Club are offering free tennis sessions for all ages and abilities on Saturday 14th May, 10am-4pm on the outdoor courts at Harewood Park behind the library in Plympton. 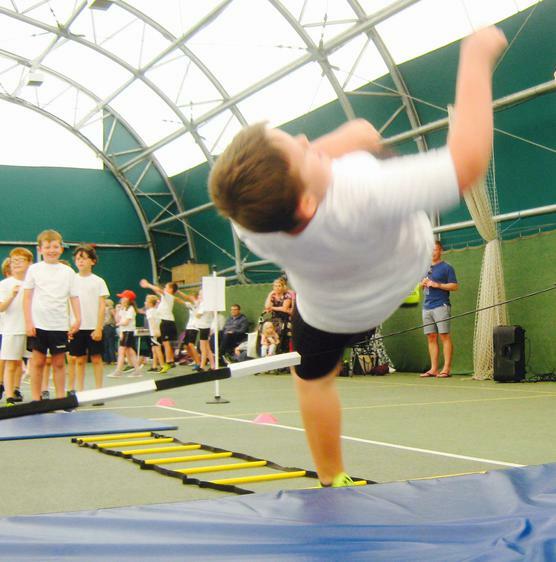 The ever-popular family sessions will run all day and there will also be exciting new sessions on offer, such as Touch Tennis, Teen Tennis and hitting against the ball machine. 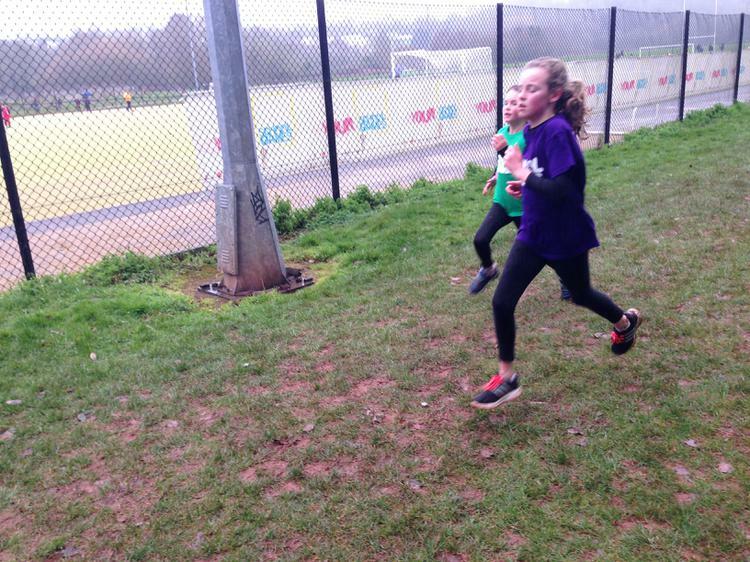 Over the last few months, many of our children have been running weekly in school, clocking up the miles, in order to complete their half-marathon challenge. An incredible 184 children have persevered, through the good weather and the bad, and have completed their 12.1 miles in school. Those children collected their t-shirts today and are posing with them below. Well done to everyone who has completed the challenge. An extra congratulations to Bethan, Elliot, Grace, Erin O and Erin R from Willow who have been running in every spare minute they had over the last few weeks and have actually completed 26.2 miles - a whole marathon - in school! What a great achievement! 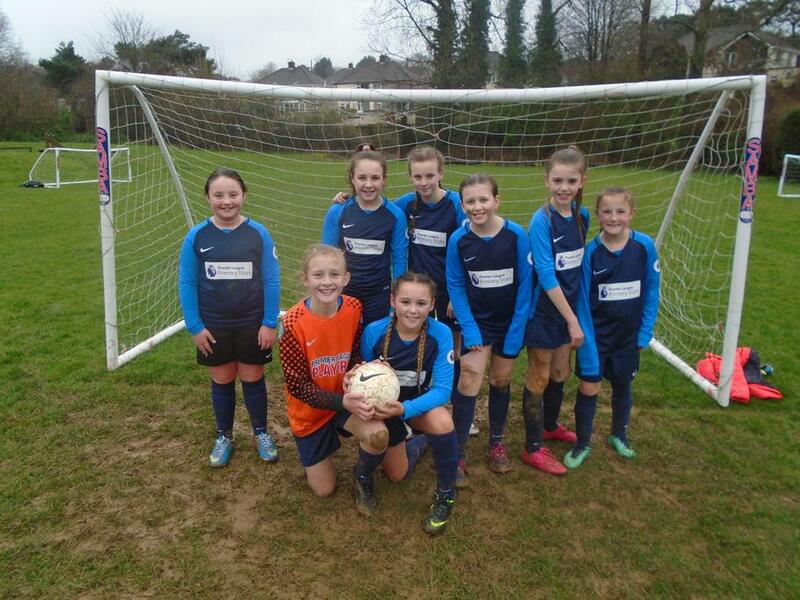 We have had a new football kit delivered this week, and to celebrate the return of girls football (after a few weeks off due to bad weather) some of our 4/5/6's tried out the kit for the first time. 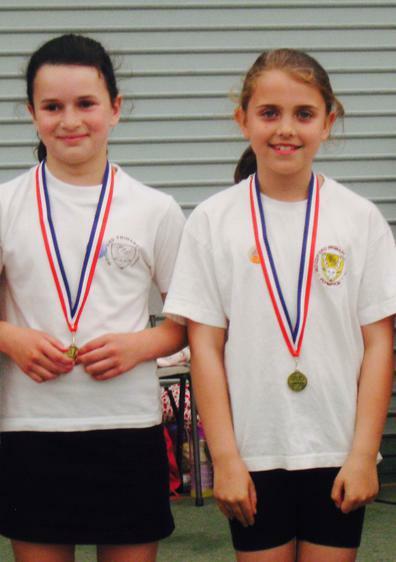 When we went to Ridgeway School, we did a multi-skills competition. It was great fun. 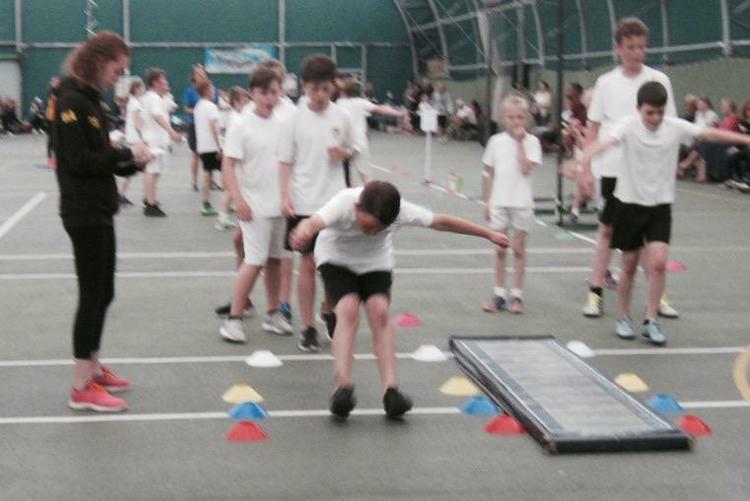 The games included long jump, speed jumping, collecting balls from cones, relay races, a game which involved throwing the ball to see how far it went and a bean bag challenge. Woodford was the winning school! I won two medals - one was for speed jumping when I completed 51 jumps in 20 seconds and the second one was for the bean bag challenge. 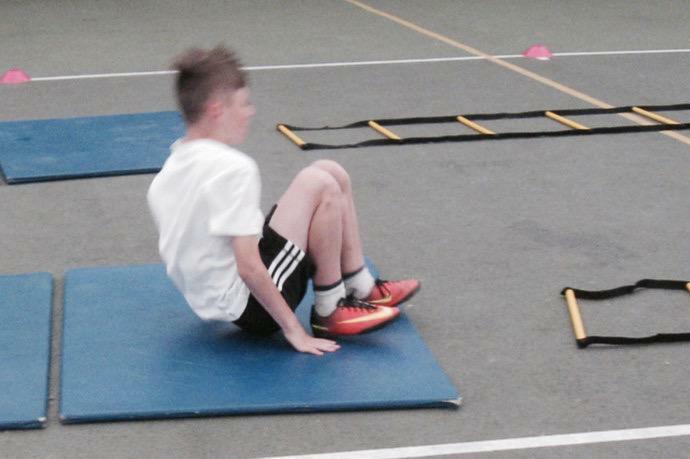 It's been a busy term for our boys football team and this week was no different. 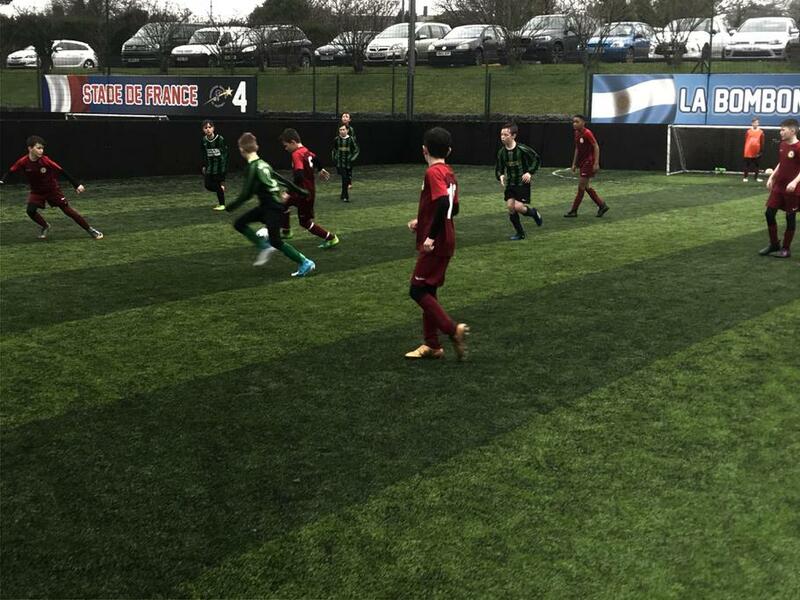 On Wednesday, as part of their prize for winning a recent city-wide 5 a-side tournament, the boys visited Home Park and took part in a Plymouth Argyle training session at Goals. On Friday, they head off to Portsmouth to represent Argyle in the League 2 South against AFC Wimbeldon, Barnet, Bristol Rovers, Cambridge, Crawley Town, Dagenham & Redbridge, Exeter City, Leyton Orient, Luton Town, Newport, Oxford Utd, Portsmouth, Stevenage, Wycombe Wanderers and Yeovil Town. Good luck boys. 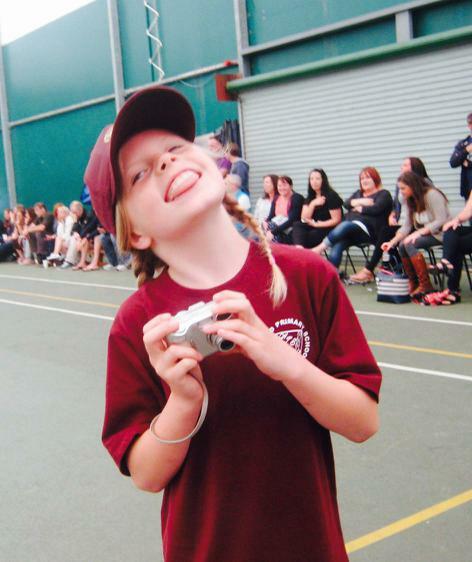 It's a massive achievement to make it so far and the whole school are really proud of you. 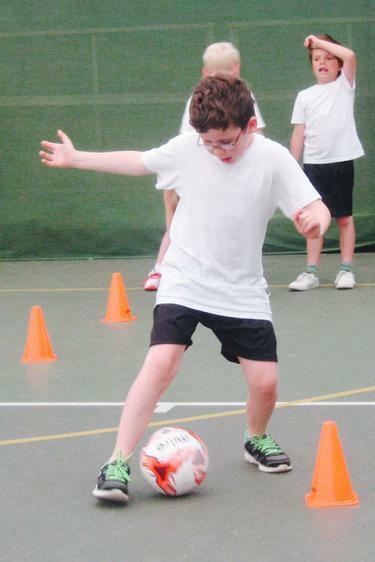 Some of our eager year 5's attended a football festival at Goals for children who were new to the sport. They performed fantastically throughout the day, finishing 2nd overall. Well to do Keegan, Lenny, Seb, Max, Lily, Katy, and Lauren - who won an individual award for the sporting attitude she demonstrated throughout the day. Plymstock School hosted the Plymouth Indoor Rowing Championships yesterday afternoon and two Woodford teams went along and continued our recent run of amazing sporting success. In the relay races, our team of Mia M, Erin R, Bethan C, Jaelyn D, Ralph P, Billy P, Zach H and Jacob H took 1st place in their race. There was an extremely exciting finish with Ralph coming from 4m down in the last 15 seconds to beat Wembury to first place. We also claimed third place in the race with a team of Lottie O, Erin O, Lara D, Tia L, Thomas R, Ben W, Andrew S and Brandon G-L ending the day on a real high. An extra big well done to Erin R who won her individual race earlier in the day and to Ralph P and Billy P who finished 2nd and 3rd respectively in their race. 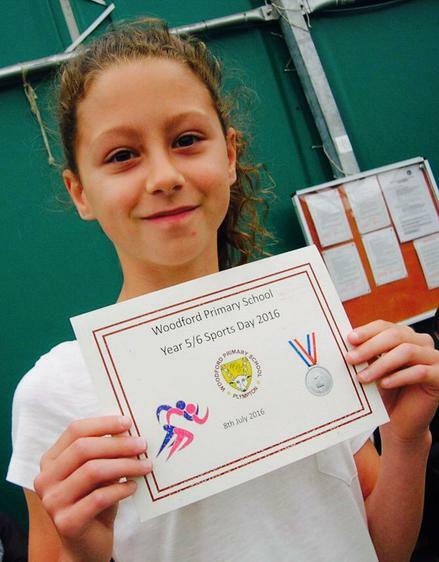 What a week for sport in Woodford! 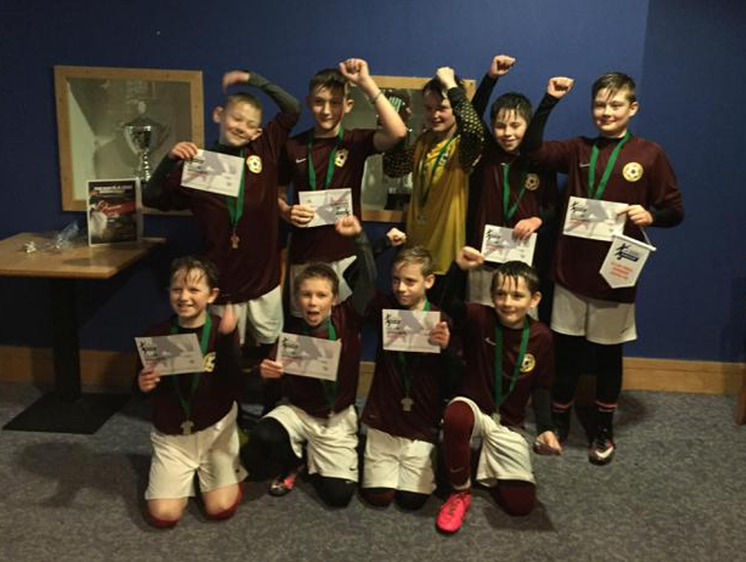 Well done to our year 6 boys' football team who won the Plymouth Goals 5 a-side tournament today. 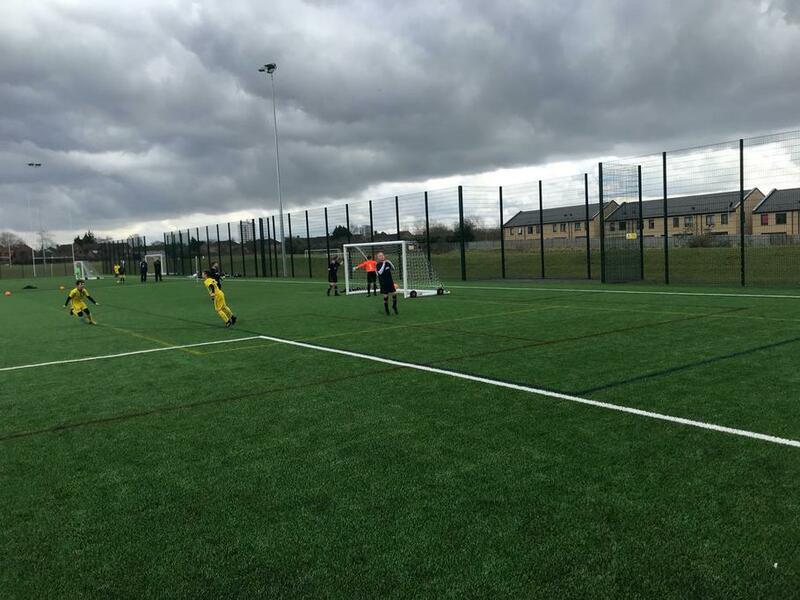 Having qualified with a 100% record from the first round on Monday, the boys returned today and made it all the way to the final before beating Elburton on penalties in a repeat of last week's Bettinson Cup final. What an achievement boys. Well done! 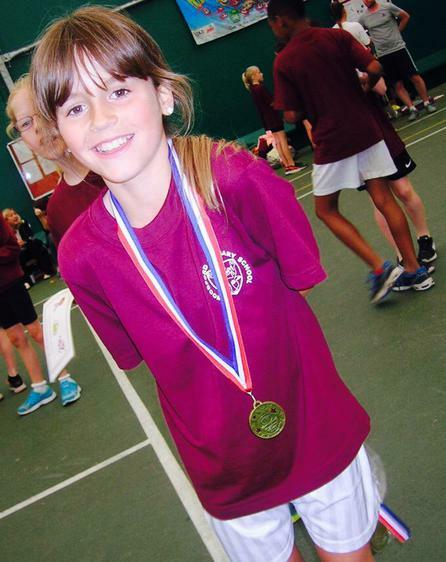 Woodford have enjoyed some great sporting success in what has been a very busy week for some of our year 6's. 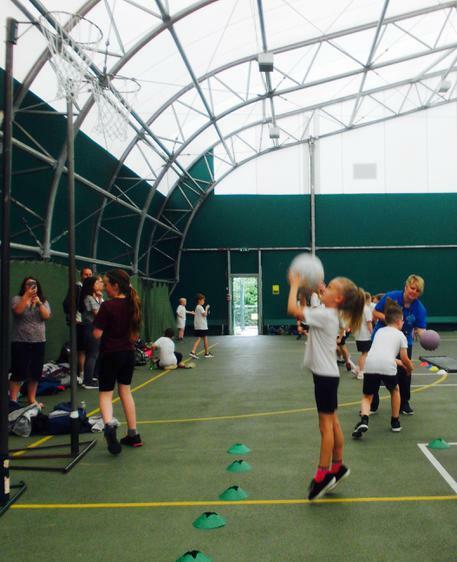 On Tuesday, our netball team went to the Plymouth High 5 Festival at Marjons aiming to follow up on their recent tournament win at Hele's. Five wins from our five games meant that Bethan, Jacob, Grace, Ralph, Erin R, Andrew and Tilly came back with winners medals and had to return the next day to compete in the finals against the other qualifiers. 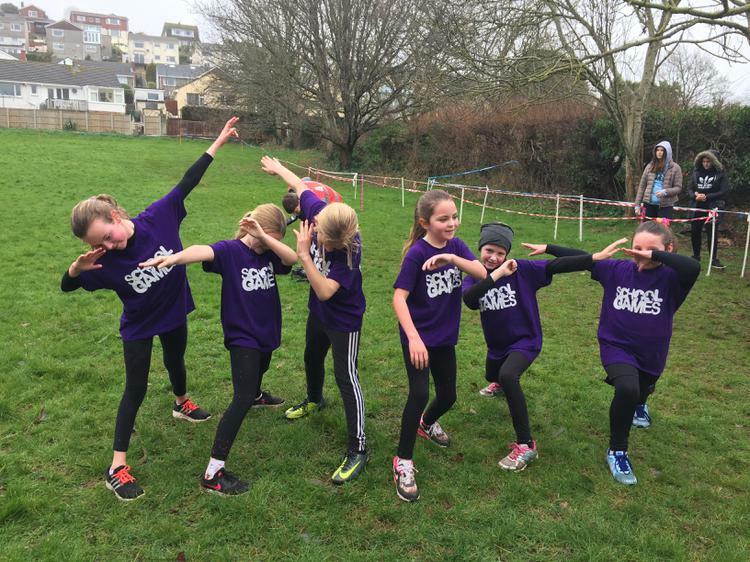 The competition was tougher on Wednesday but 1 win, 3 draws and 1 defeat was enough to finish in 4th place overall, meaning that we have qualified to represent Plymouth in the Devon High 5 Festival in Paignton in March. Well done to all children who represented the school superbly. 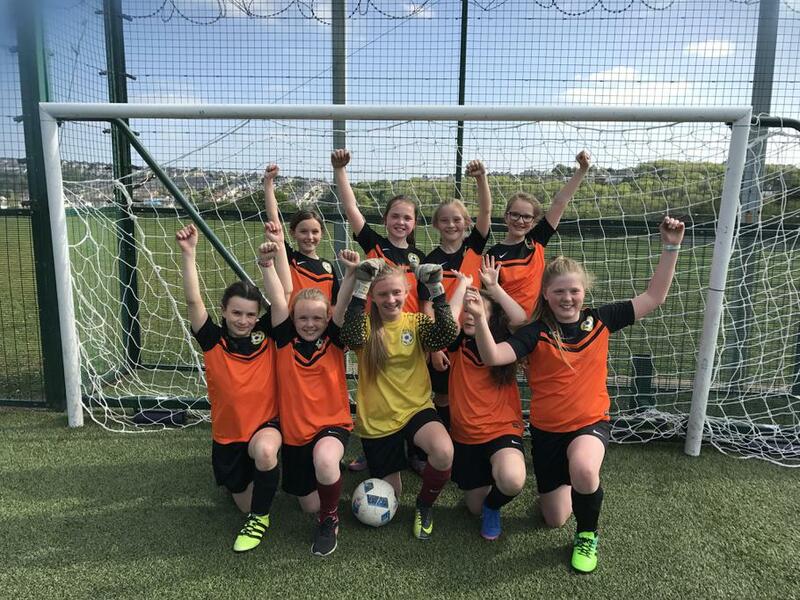 On Wednesday after school, our year 5 and year 6 football team went to Plymstock to compete in the Bettinson Cup Finals have previously qualified from the group stages. 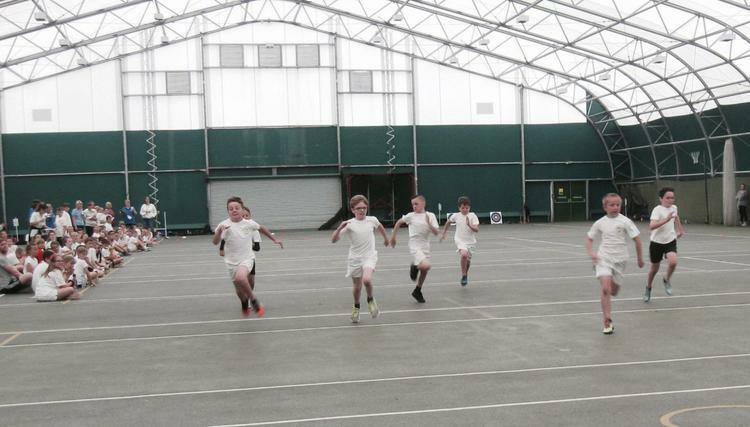 The year sixes won every group match on Wednesday, making it through to the knock-out stages. 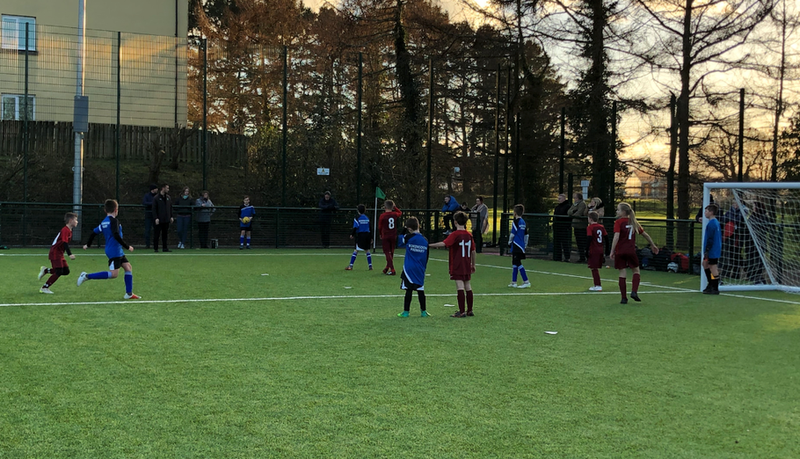 We then beat St Joseph's in the quarter final, overcame Boringdon in a penalty shoot-out in the semi-final before losing 1-0 to Elburton in the final. Well done to Andrew, Elliot, Brandon, Ryan, Matthew, Harrison, Alex, Lewis and Taylor on their fantastic achievement. Your runners-up trophy is richly deserved. 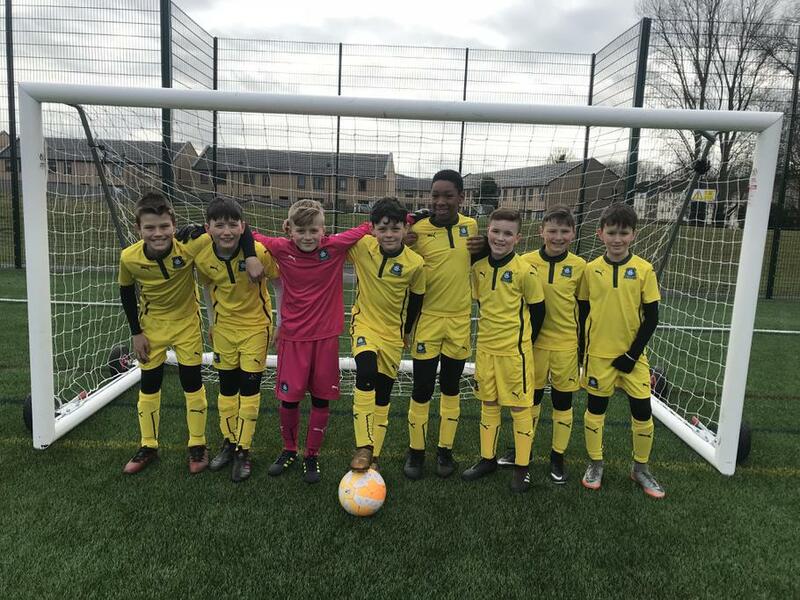 This week, our year 5/6 boys football team have taken part in two separate five a-side tournaments at Ridgeway School, competing against Yealmpstone Farm, Glen Park and Chaddlewood on both occasions. On Tuesday, the first night, we beat Glen Park 2v0, defeated Chaddlewood 3v2 and, in the final match, won 6v0 against Yealmpstone Farm, to finish the tournament with a 100% record. We left the tournament as champions, with a new squad returning on Wednesday hoping to add to our silverware. On the second night, we beat Glen Park 2v1, drew 2v2 against Chaddlewood and then faced off against Yealmpstone Farm in the last match, knowing a win would make us champions once again. Spectacularly, we won 9v0 to claim our second set of winners medals. Well done to Andrew S, Billy E, Brandon G-L, Elliot E, Lewis B and LJ P who represented the school so well on Tuesday and to Samuel N, Matthew N, Alex C, Sam R, Ryan C, Mason E and Lewis B (again!) who were equally brilliant on Wednesday. 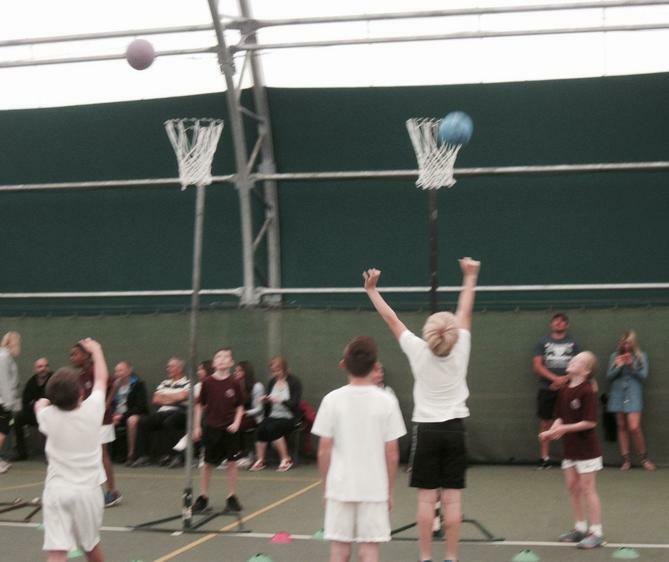 Our year 6 netball team were victorious at a tournament at Hele's on Tuesday evening. Well done to Andrew, Alfie, Bethan, Erin R, Grace, Jacob, Ralph and Tilly who represented the school brilliantly. 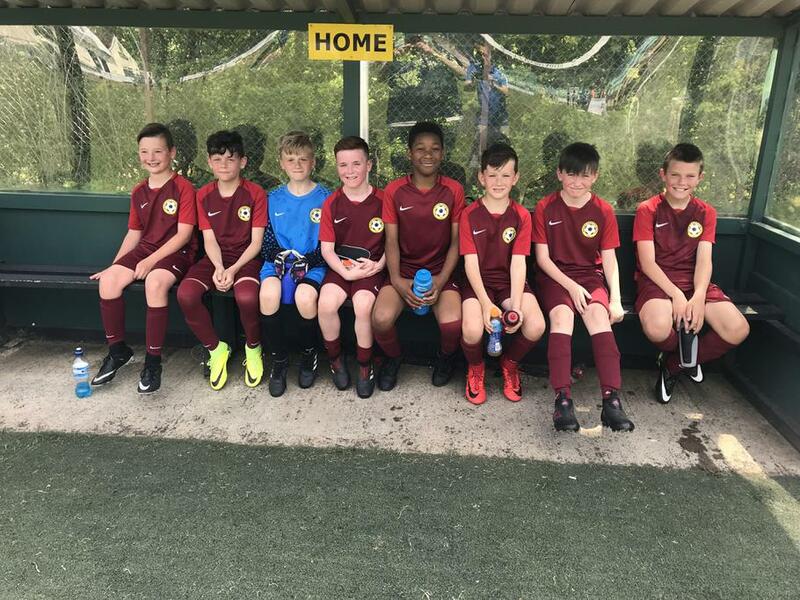 Our quick attacking play and determined defence was crucial as we won through a group stage involving Glen Park, Oakwood, Yealmpstone Farm and Victoria Road before defeating St Peters in the semi-final. The final, against Yealmpstone Farm was a tight affair and after a 0-0 draw, Andrew scored the Golden Goal in extra-time! 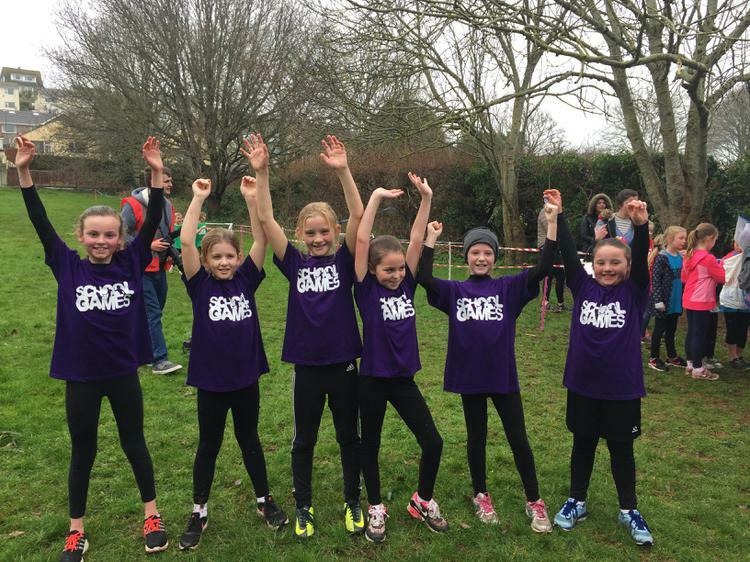 Well done to Grace, Ella C, Bethan, Kayla and Lily and Mason, Taylor, Alex C, Tyler, Billy E and Matthew N who competed in the Staddiscombe Cross-Country this afternoon. 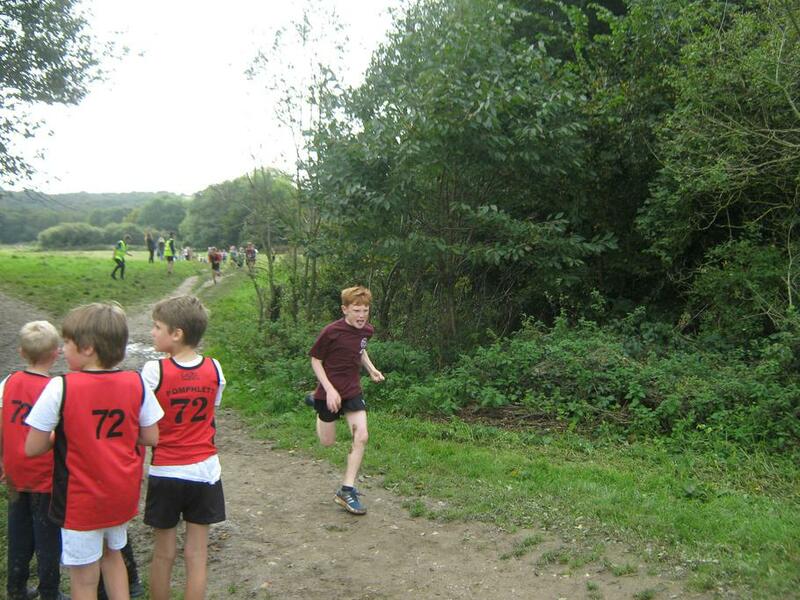 Around 150 children ran in both the boys' and the girls' race and all of our children did fantastically well. Mason (13th) and Grace (32nd) were the first Woodford runners to complete the 1.78km course, closely followed by their teammates. 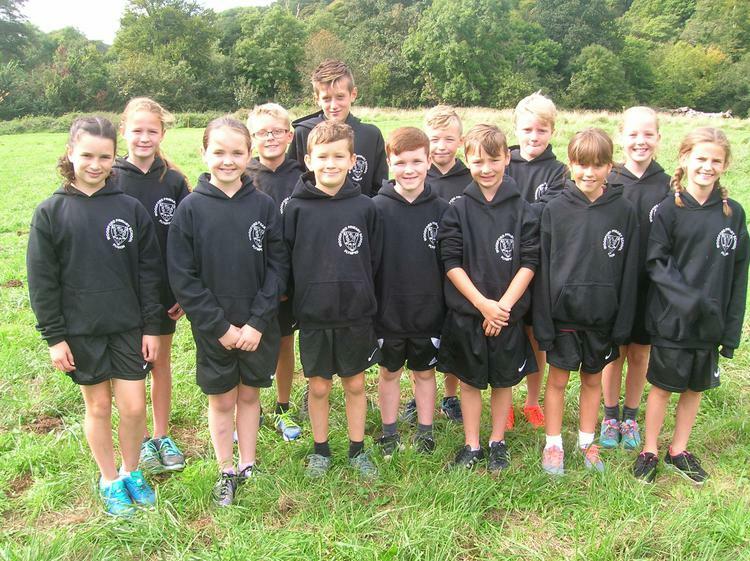 Twenty-six children from years 5 and 6 at Woodford attended the Plympton Schools Cross-Country at Hele's on Tuesday after school. 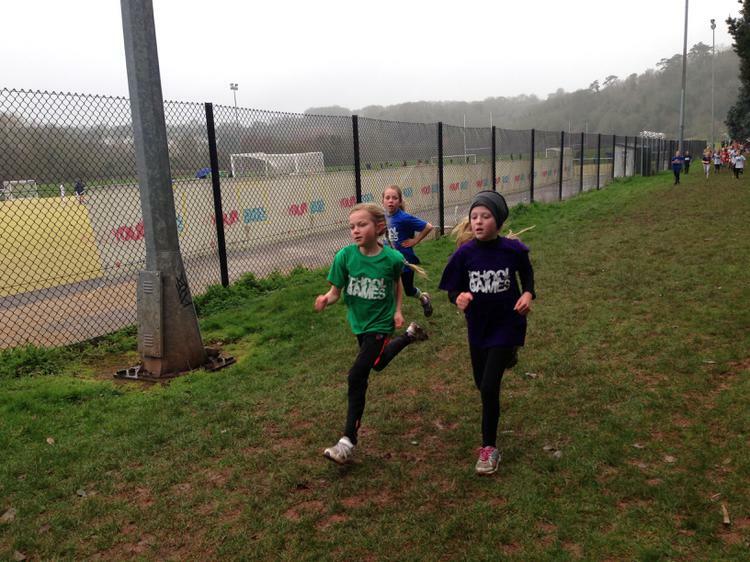 Our boys and girls braved the rain and put in a terrific performance on the 1600m course. Well done to Mason E (3rd), Matthew N (5th) and Tyler W (9th) who all finished in the top 10 in their event and to the boys team as a whole who finished 2nd behind Old Priory.